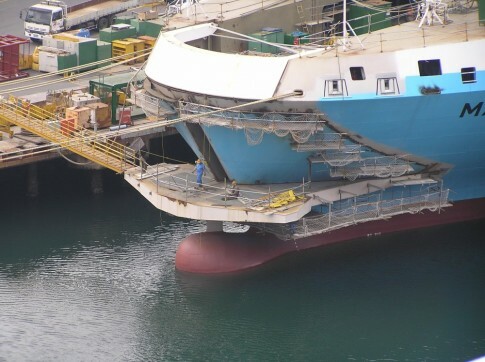 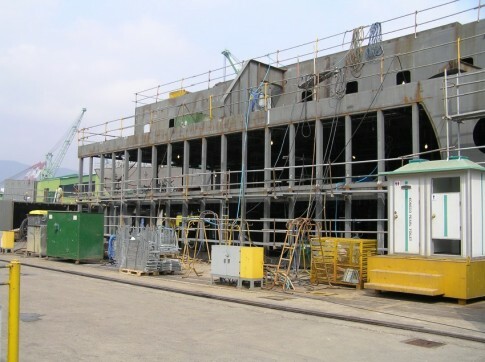 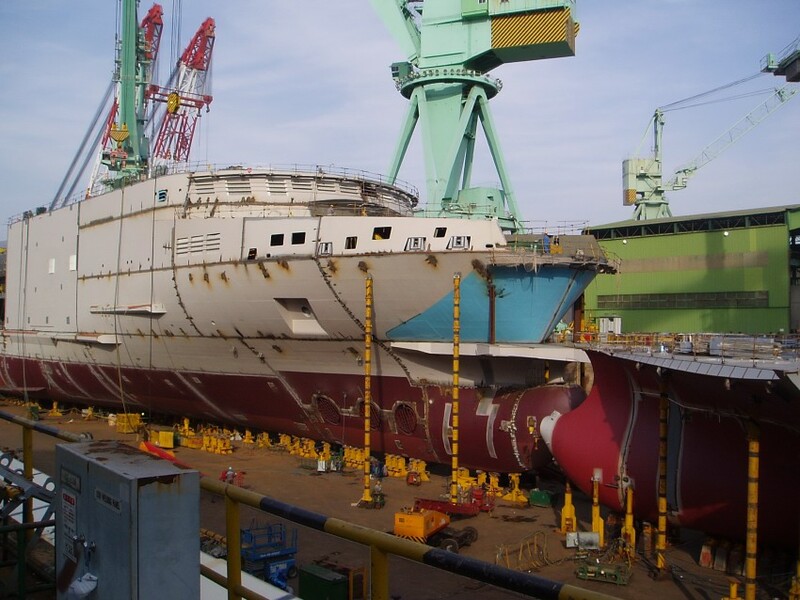 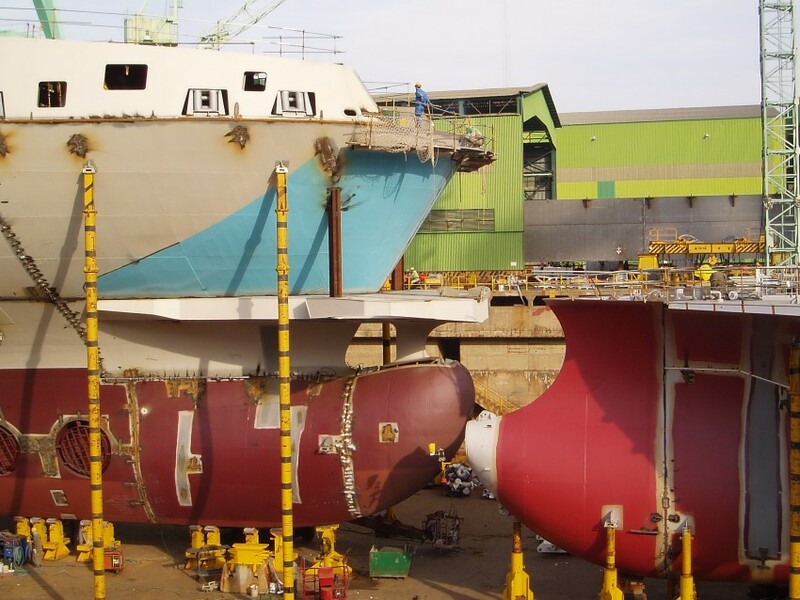 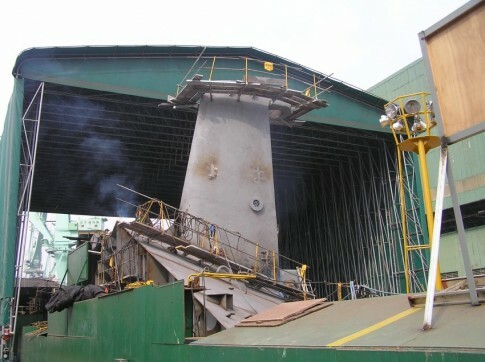 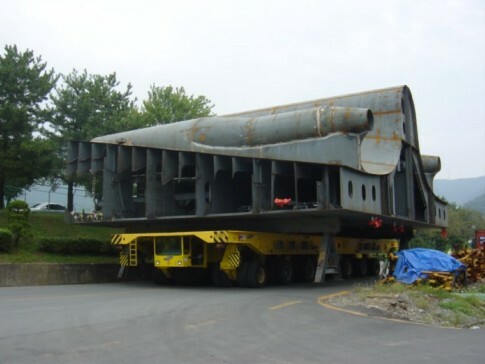 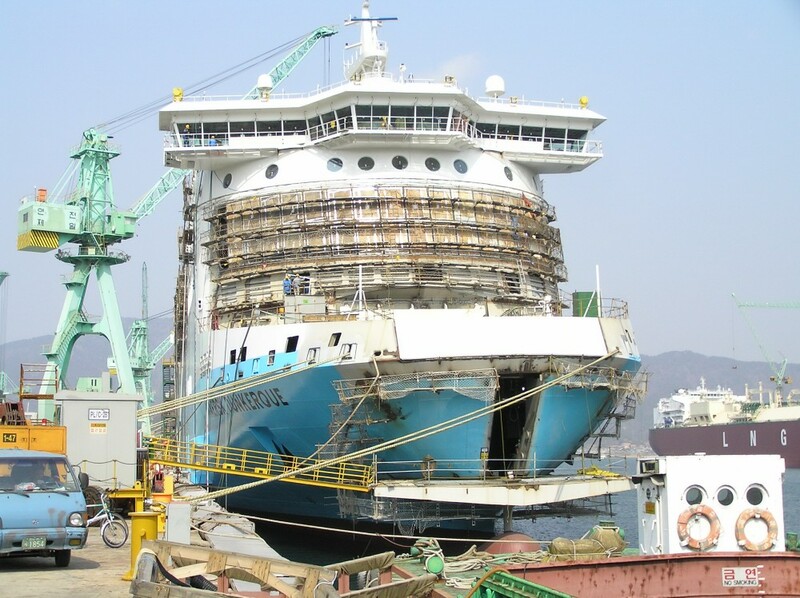 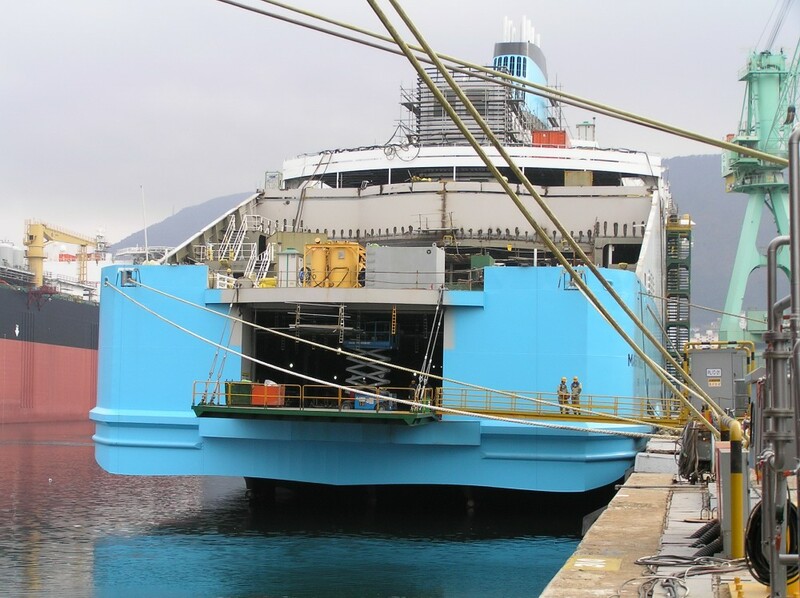 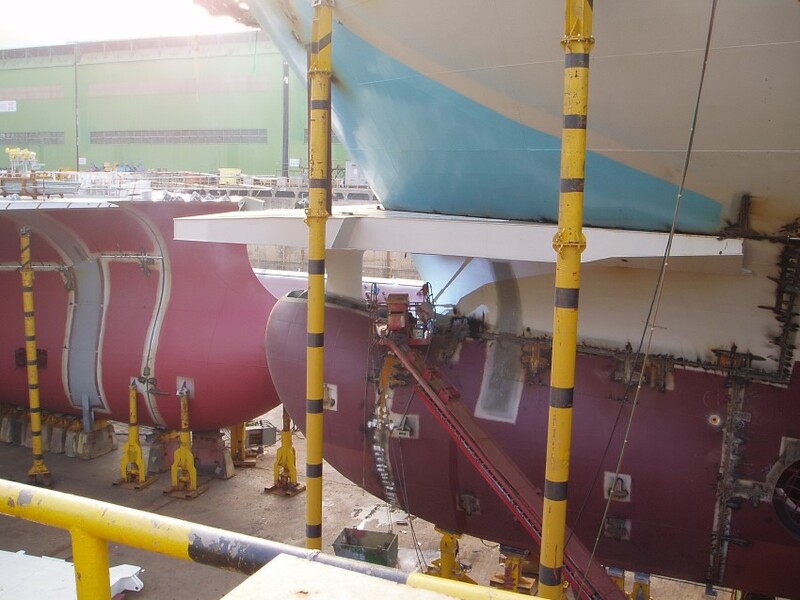 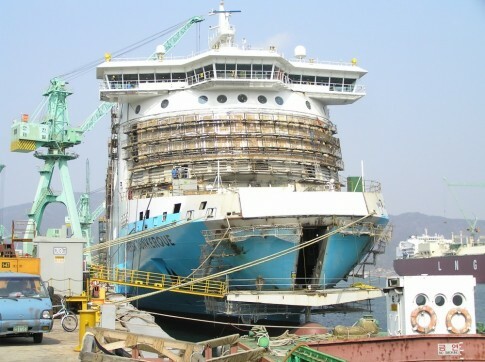 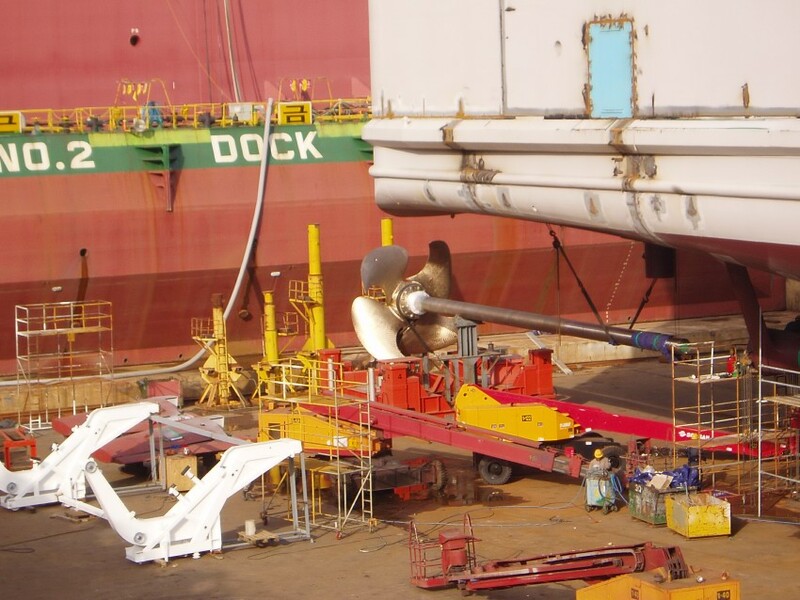 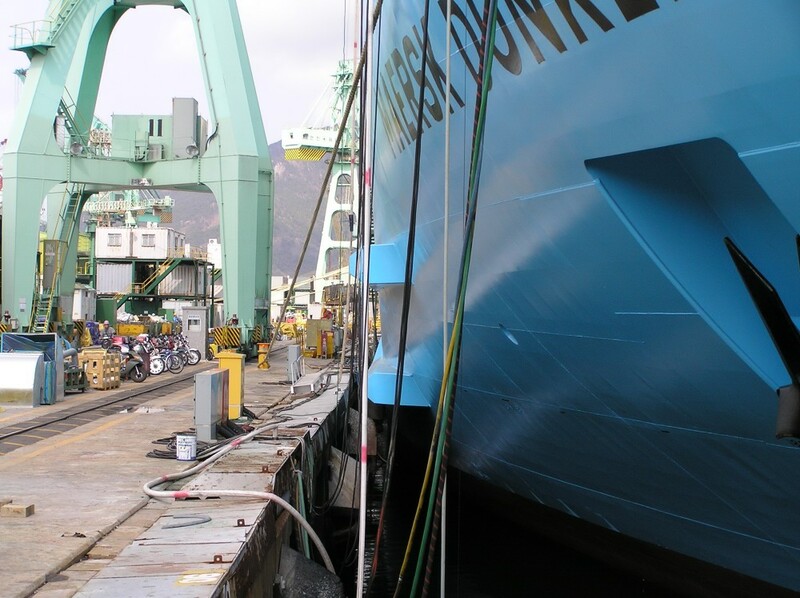 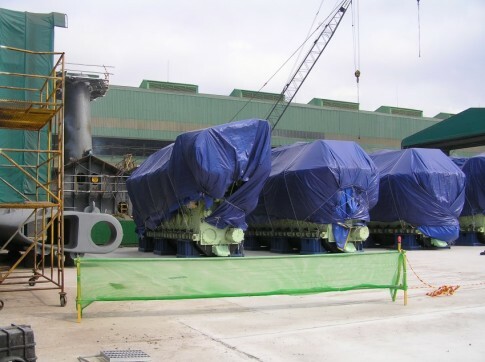 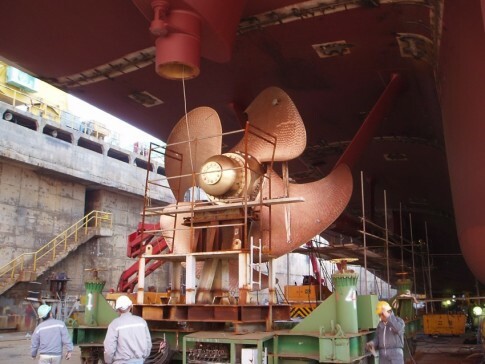 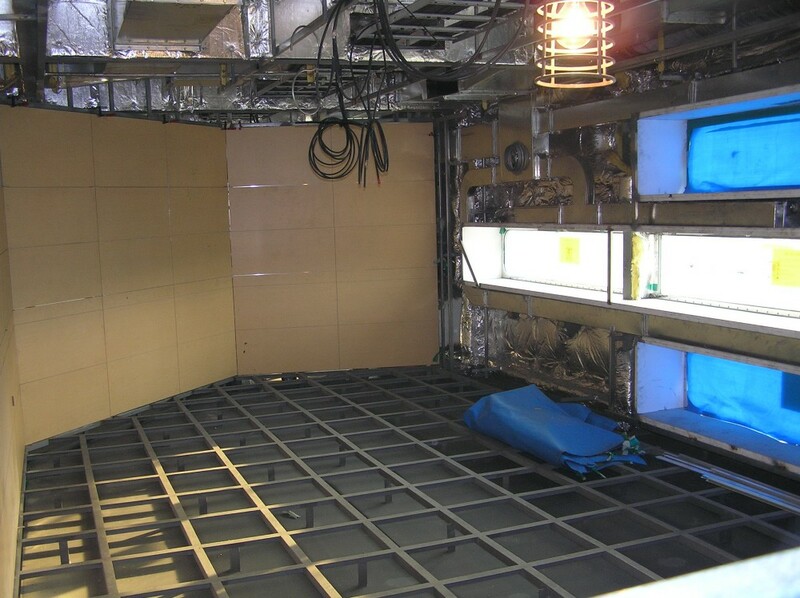 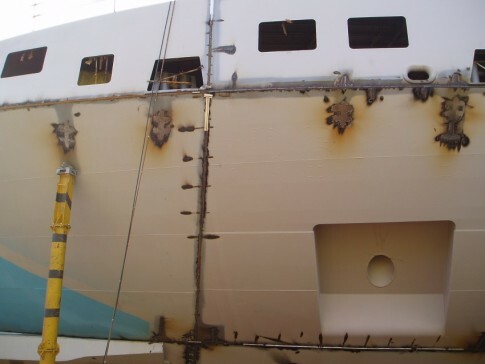 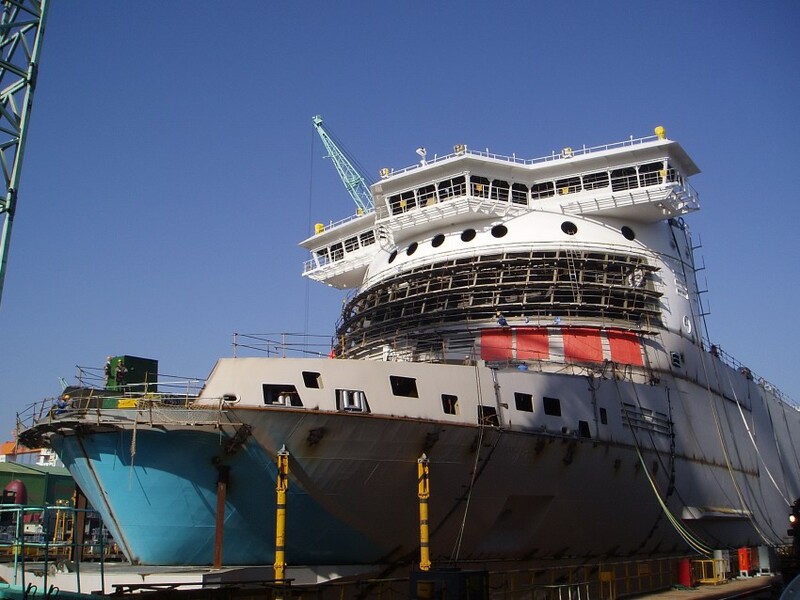 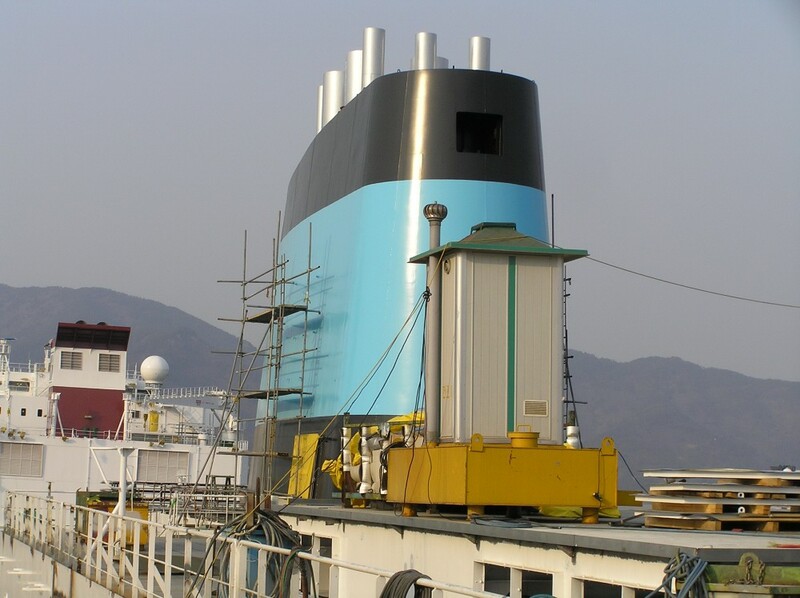 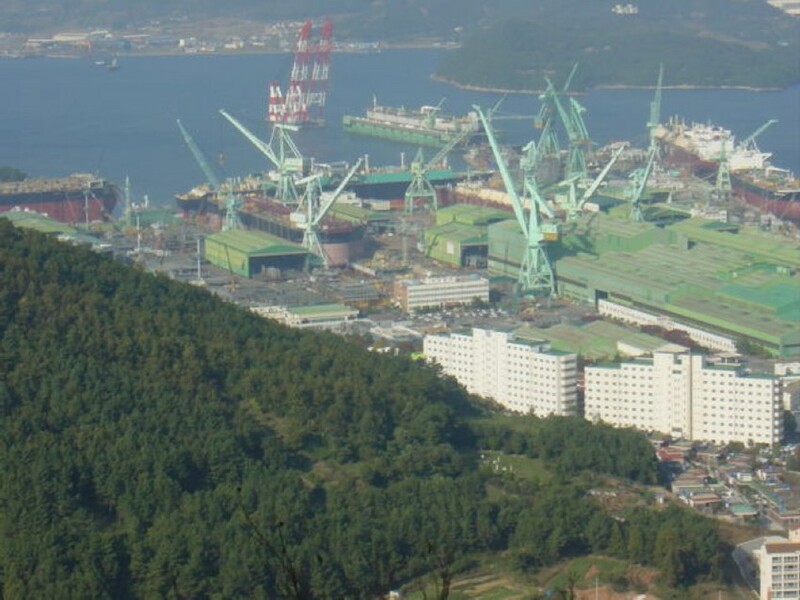 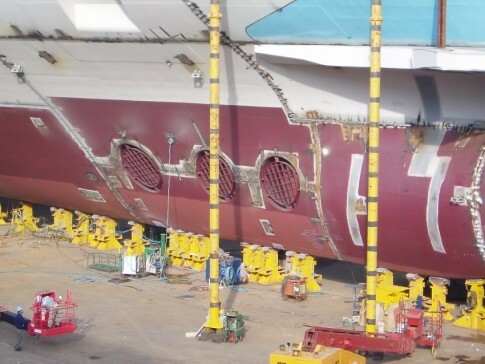 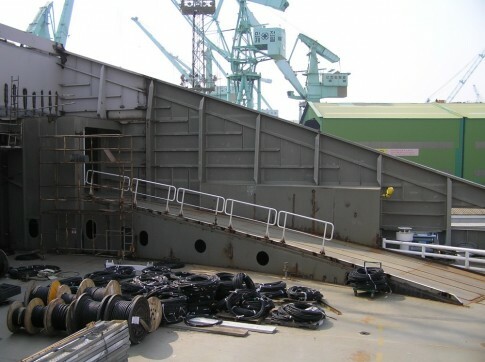 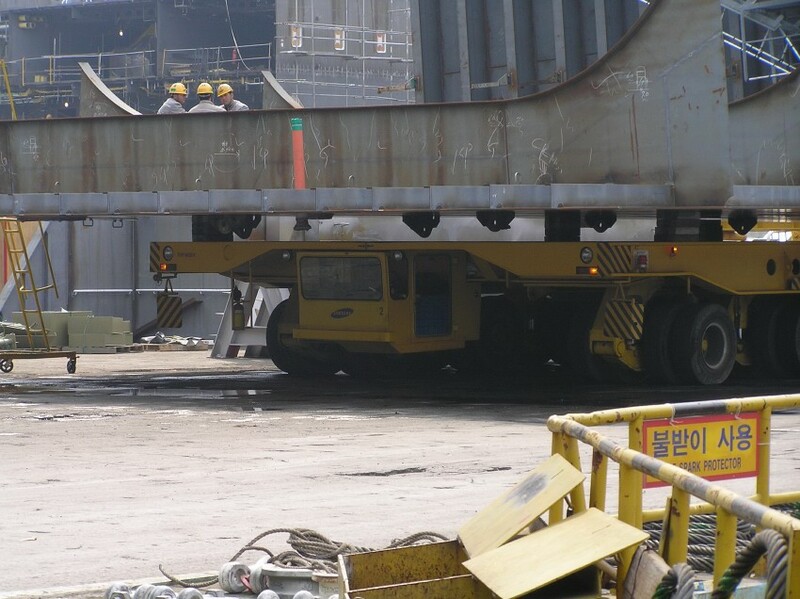 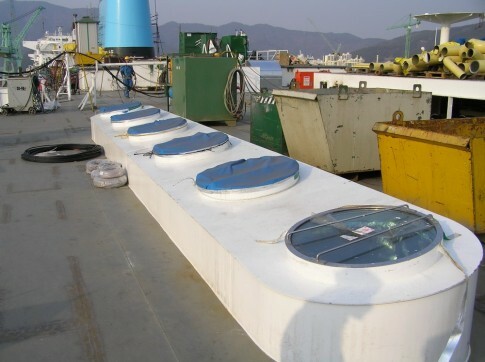 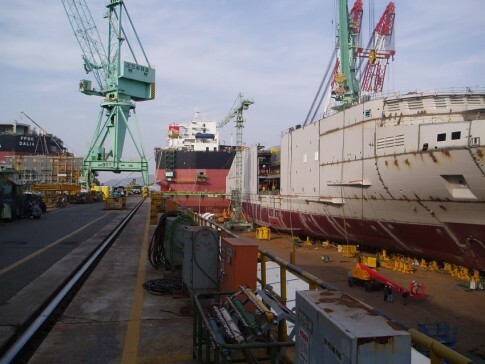 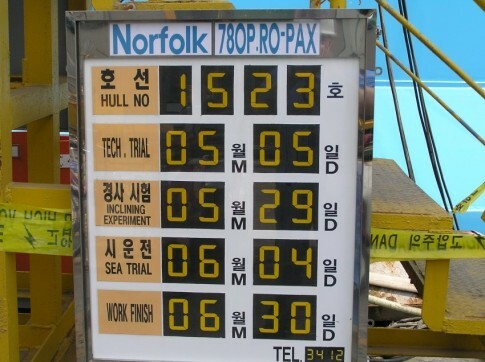 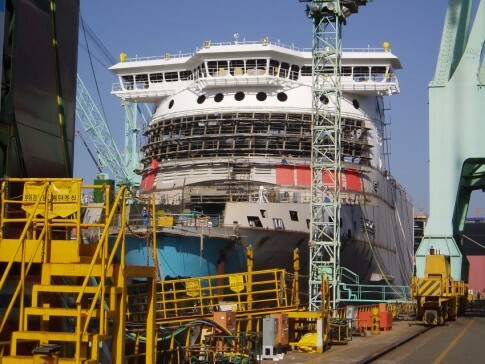 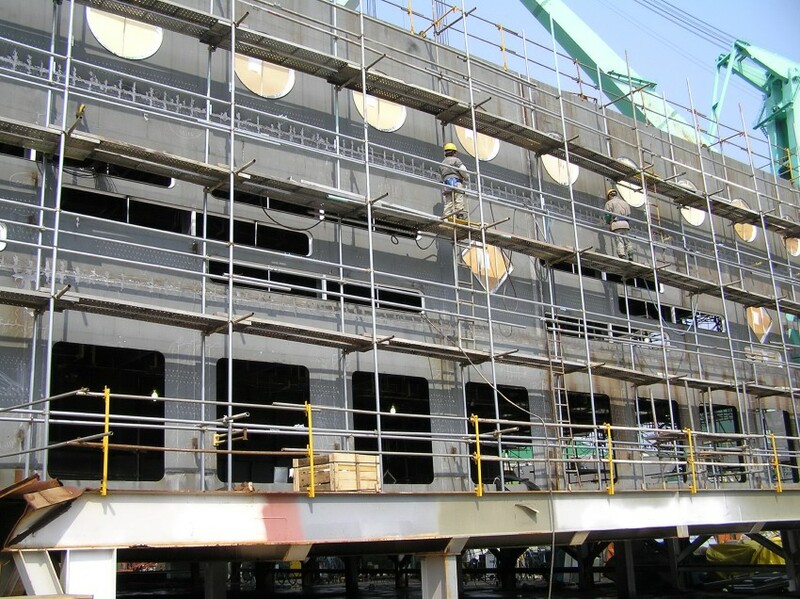 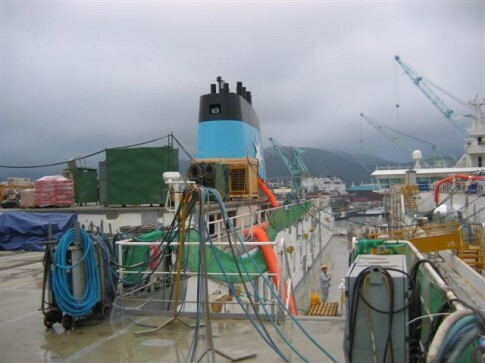 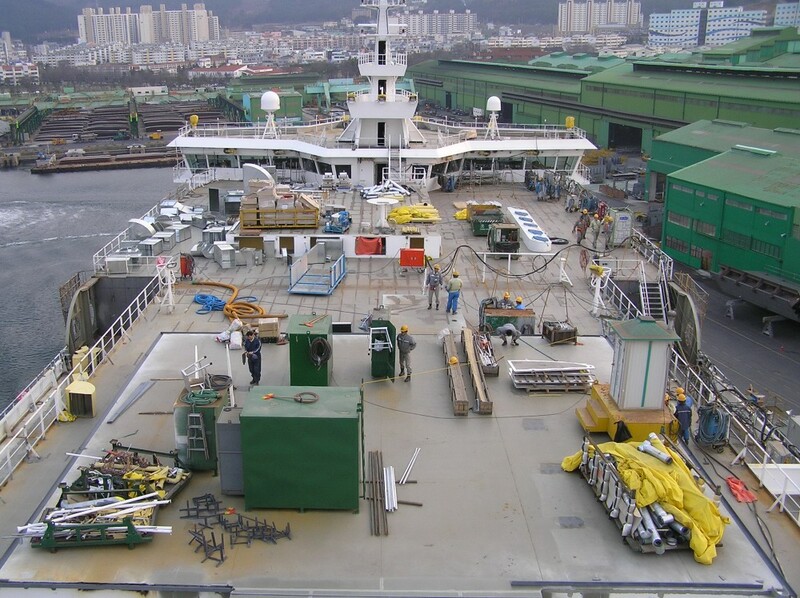 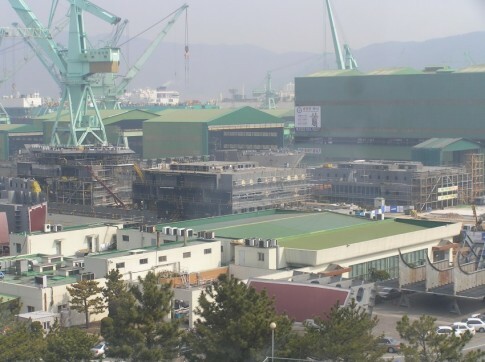 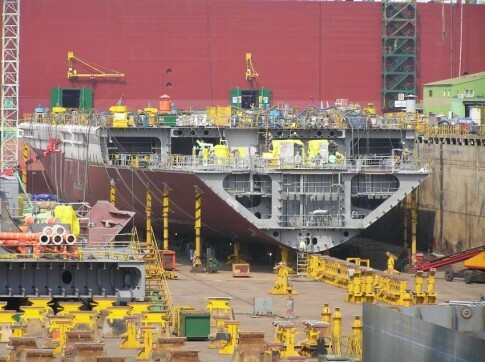 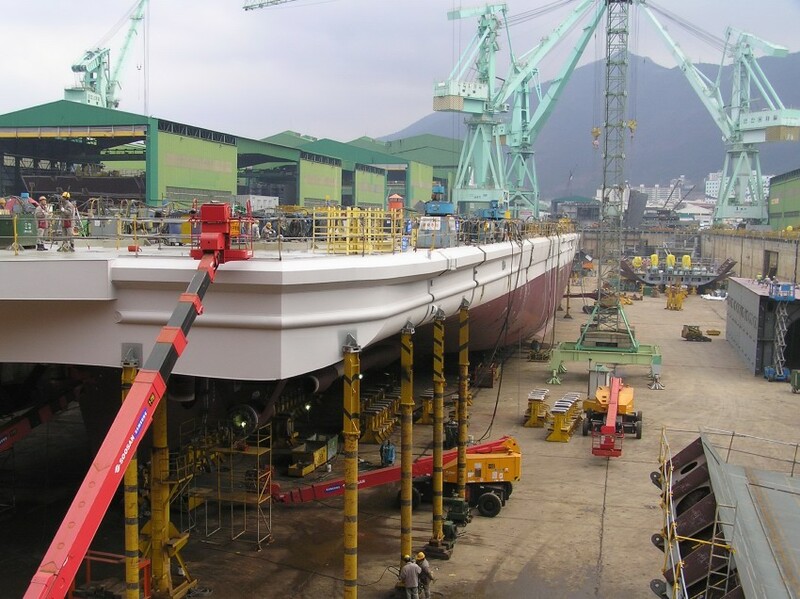 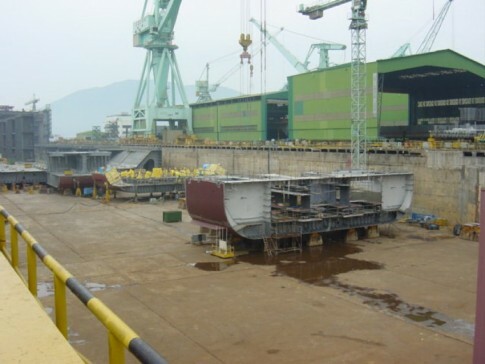 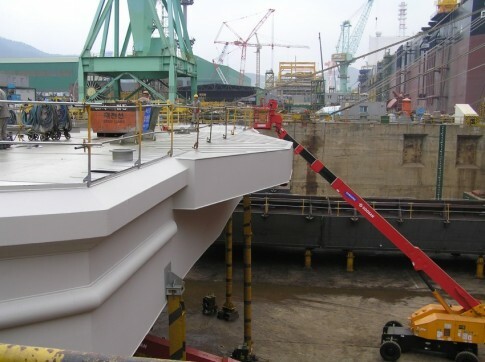 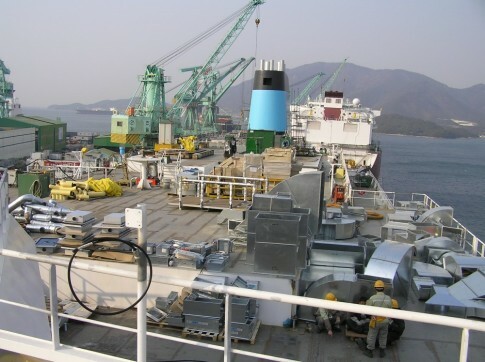 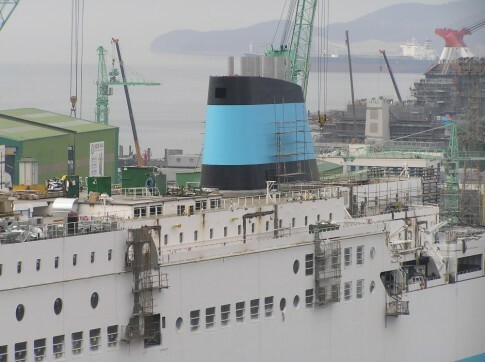 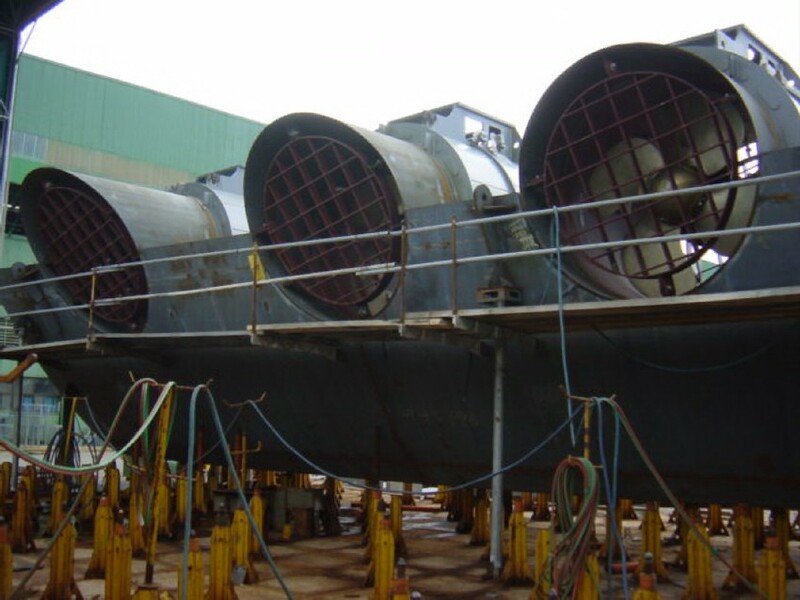 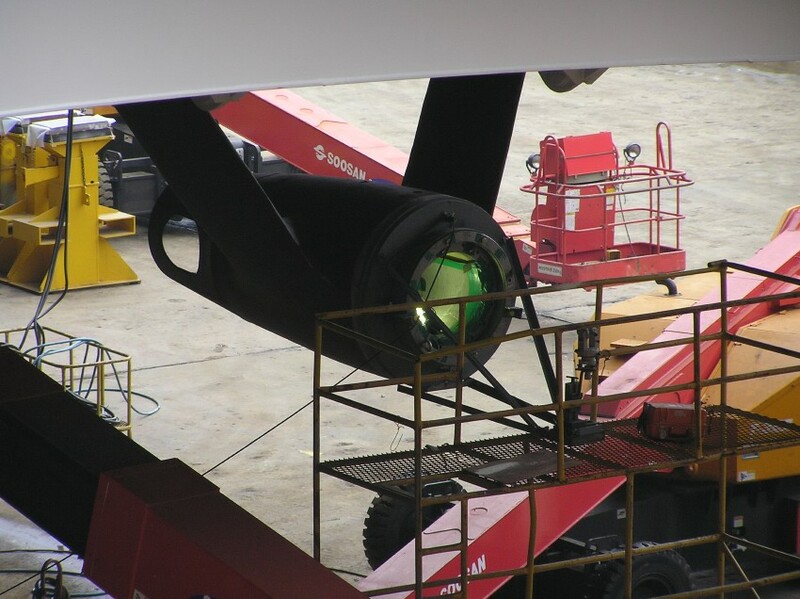 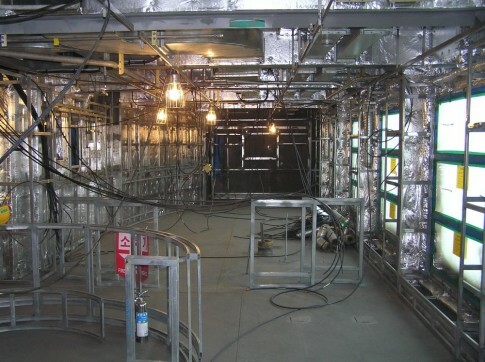 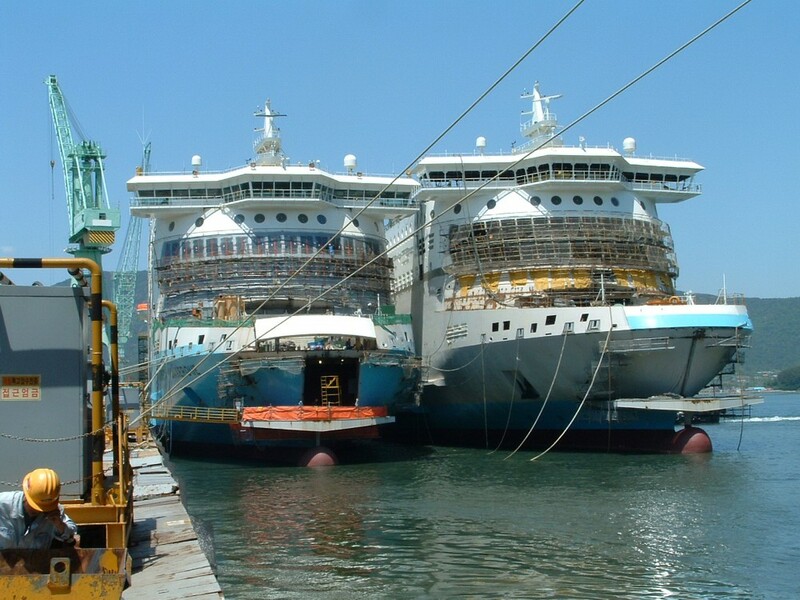 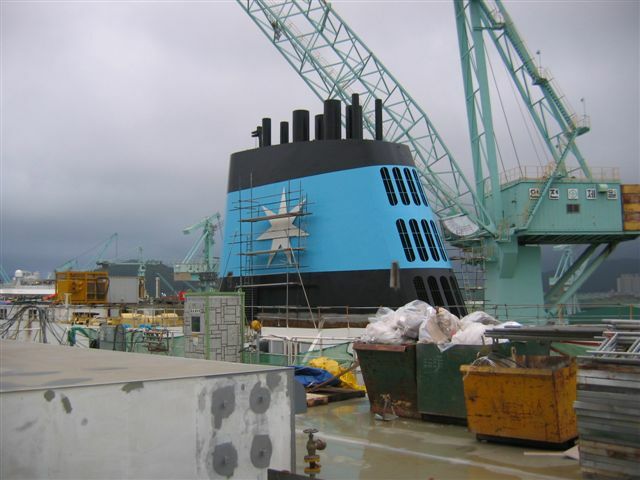 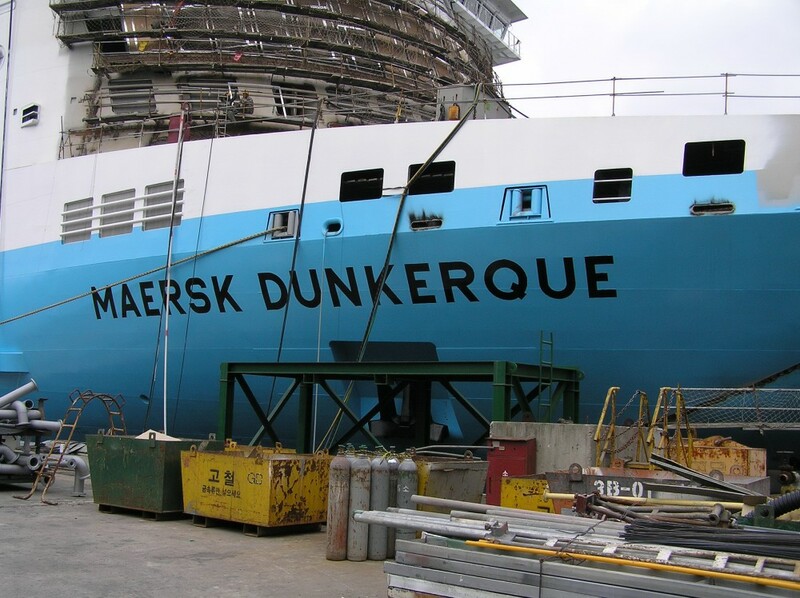 In this part of our review of the construction of Norfolkline’s ‘D’ Class, we move inside the Maersk Dunkerque in mid-2005 as the interiors of the ship were assembled at the Samsung shipyard at Geoje in South Korea prior to the handover to her owners that September. 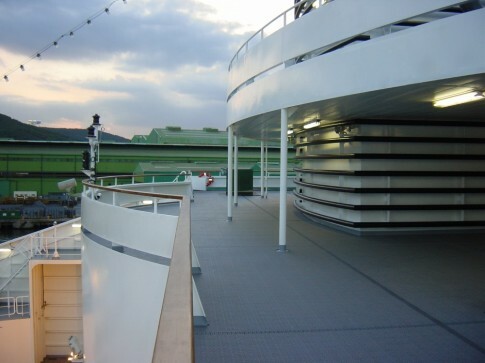 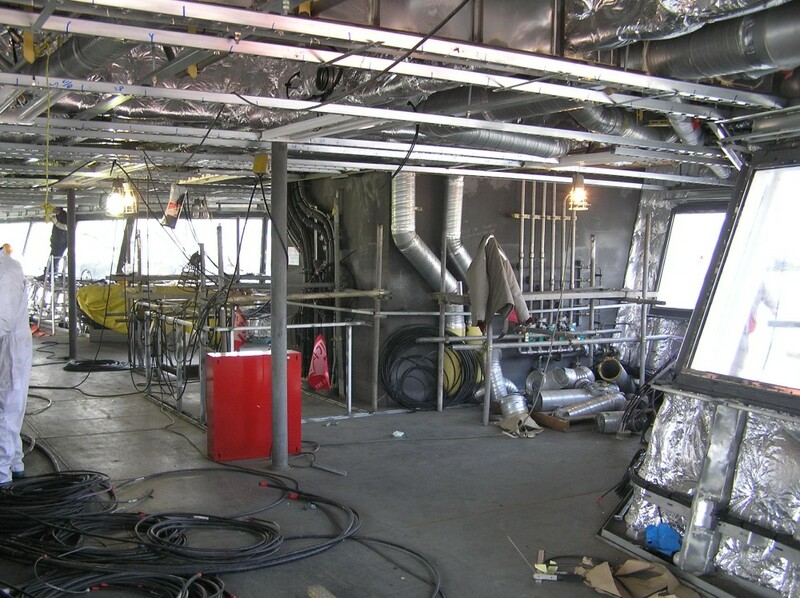 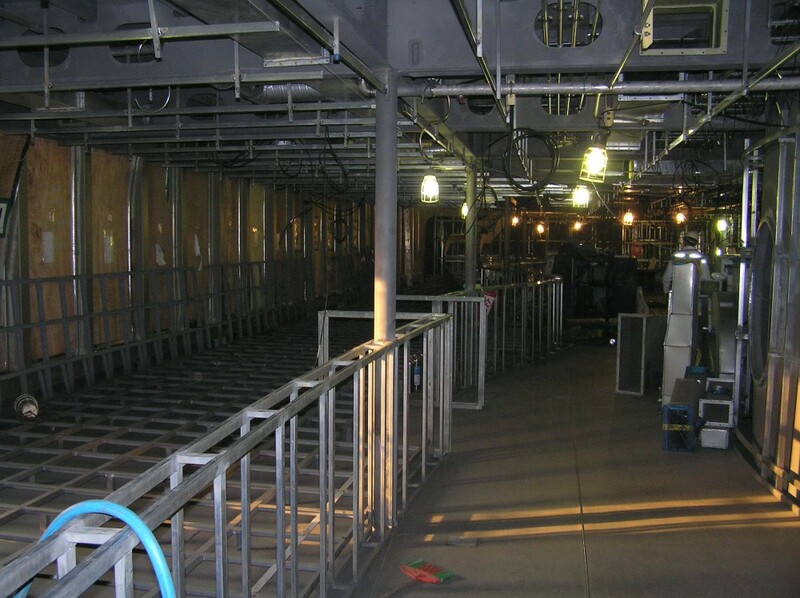 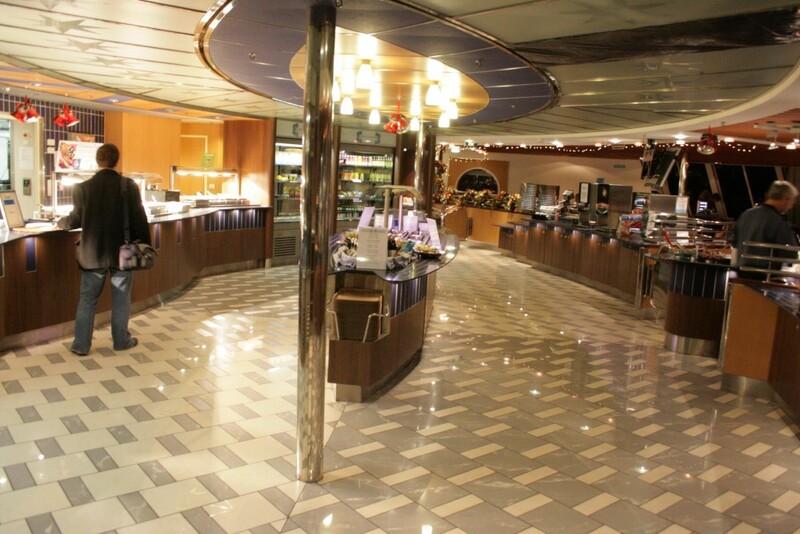 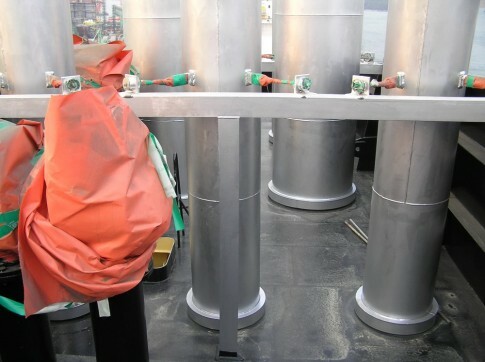 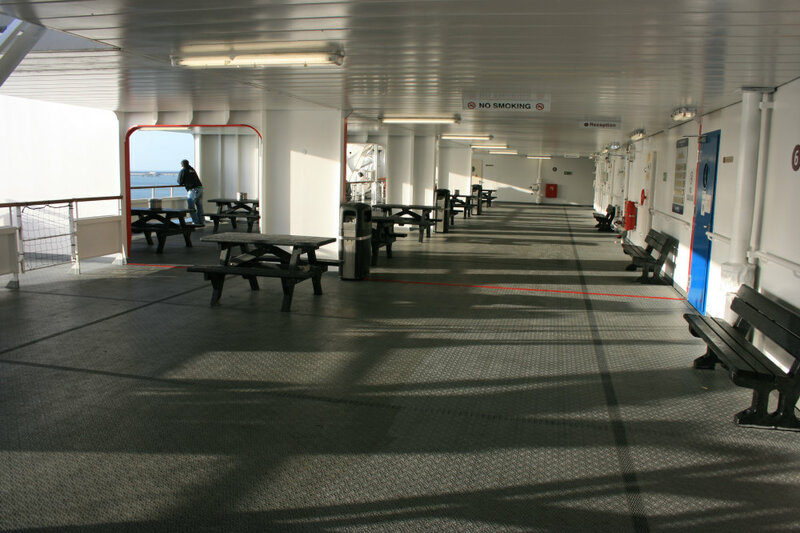 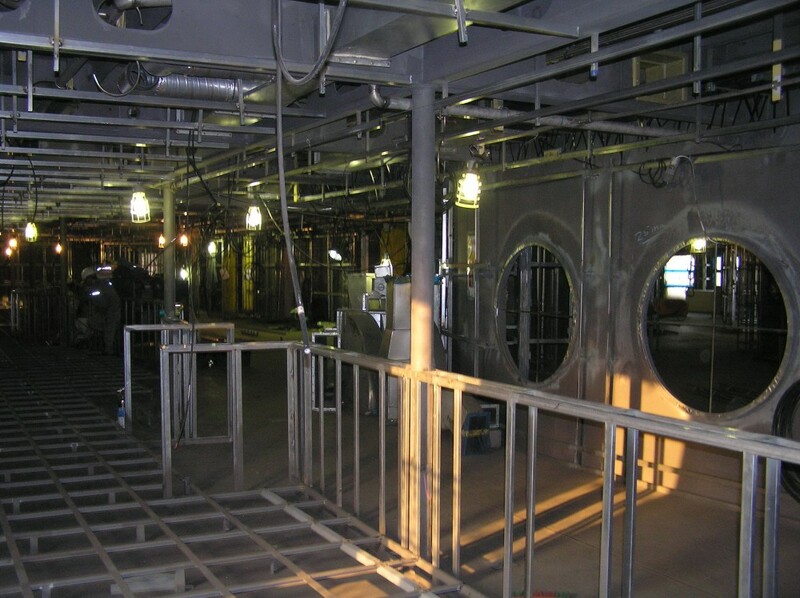 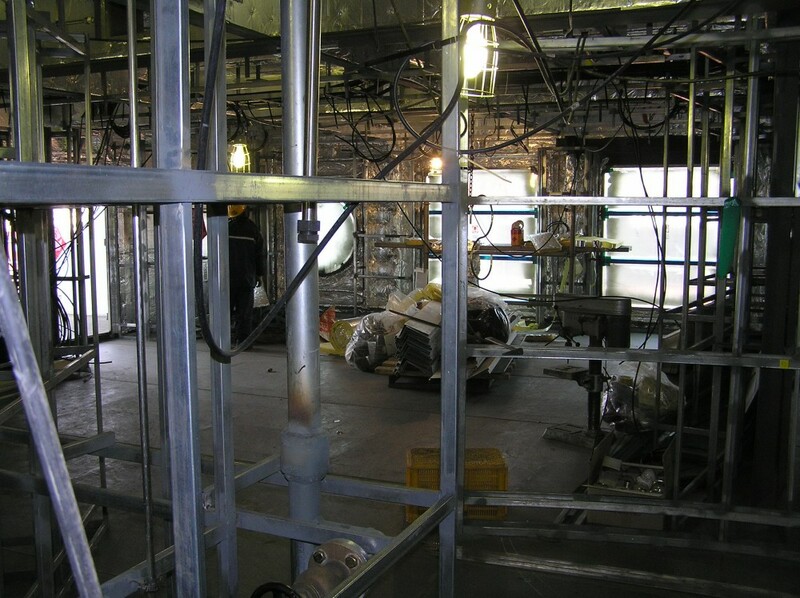 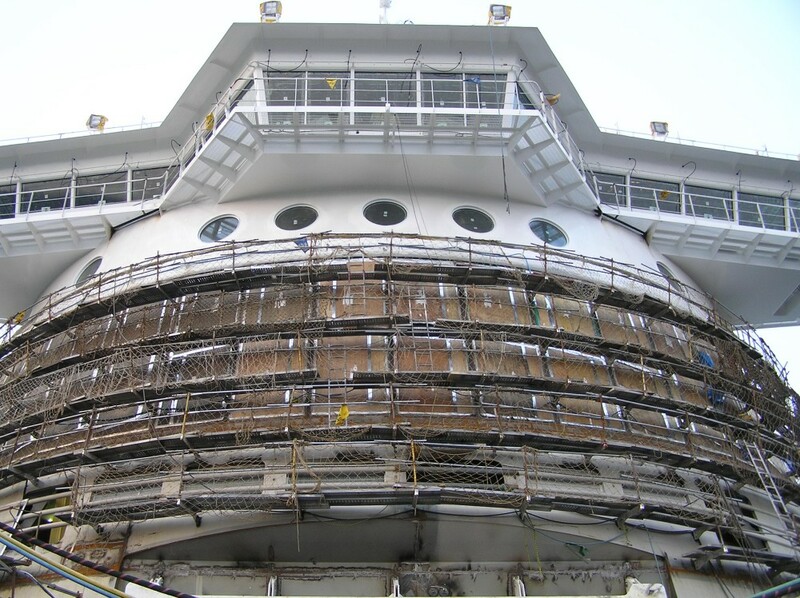 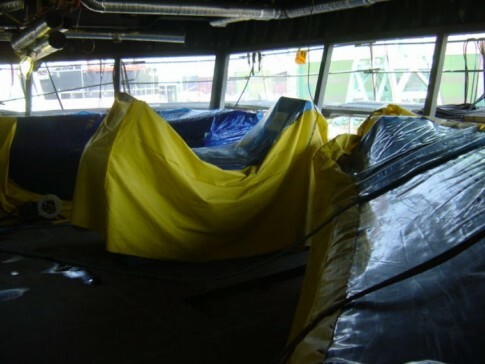 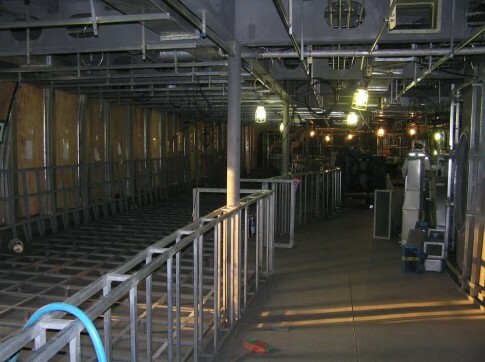 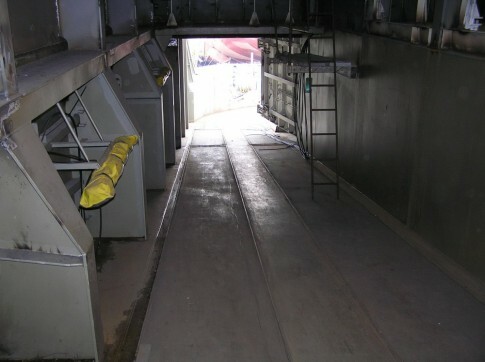 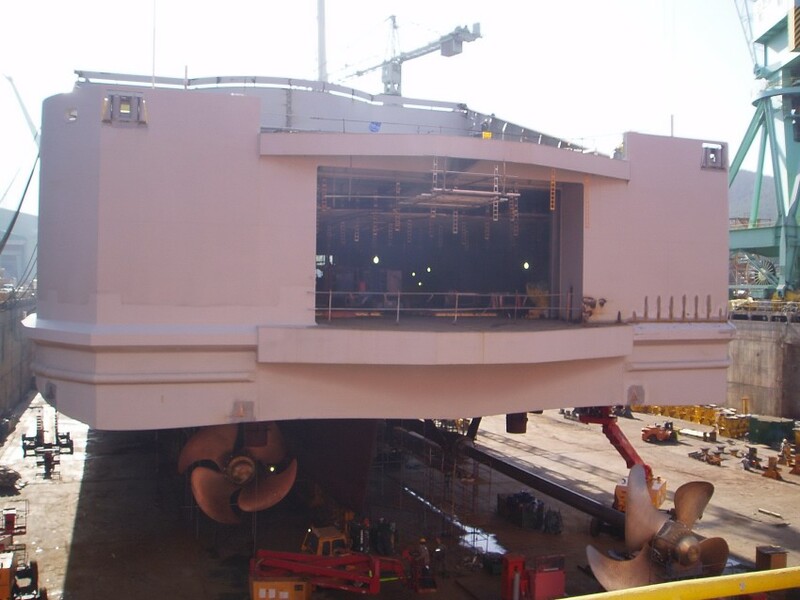 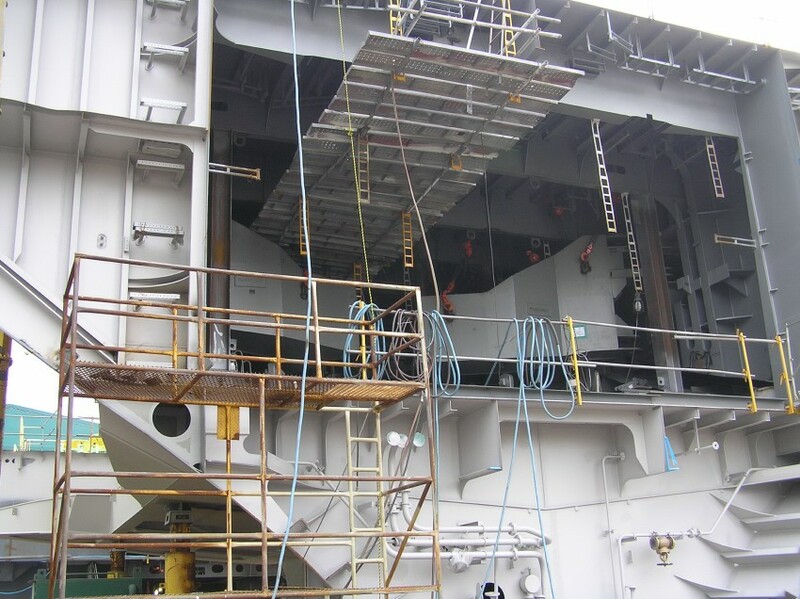 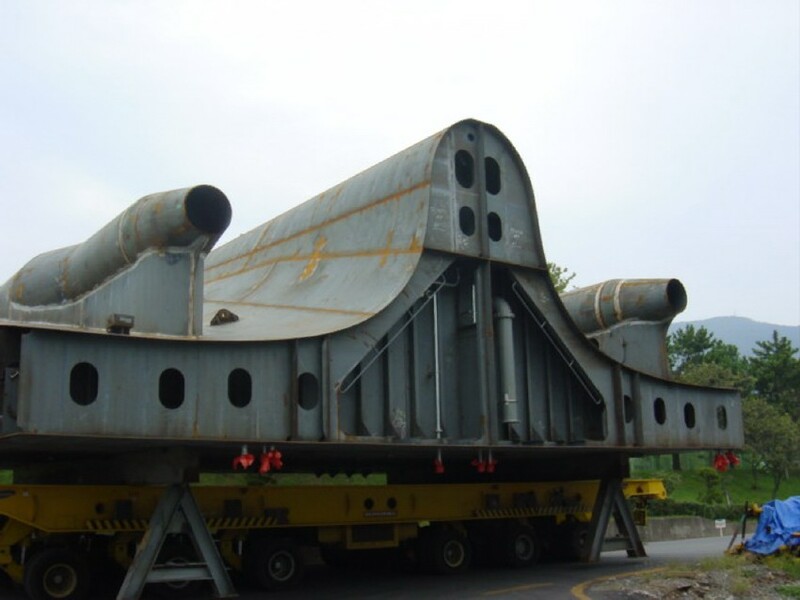 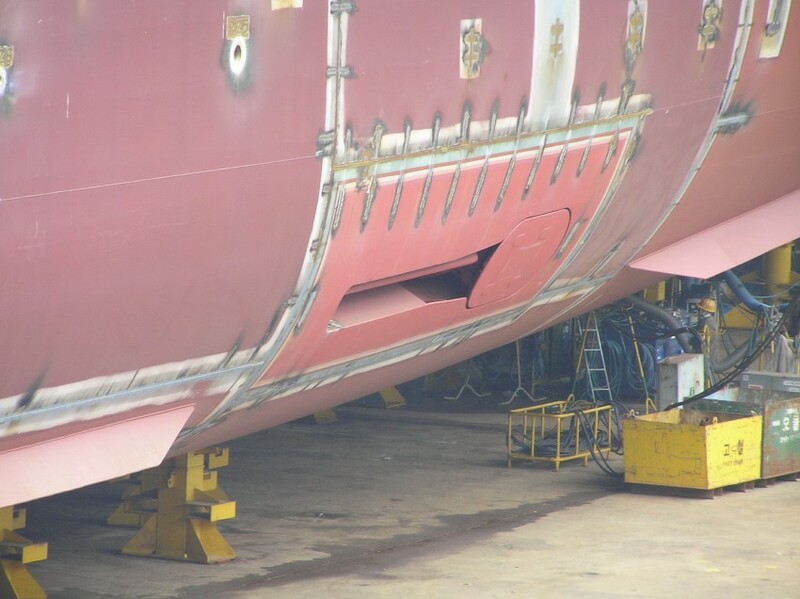 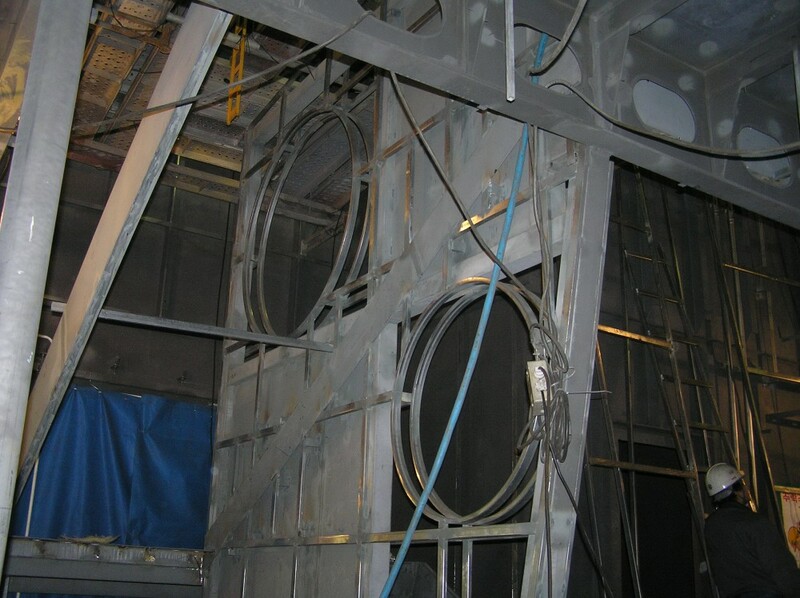 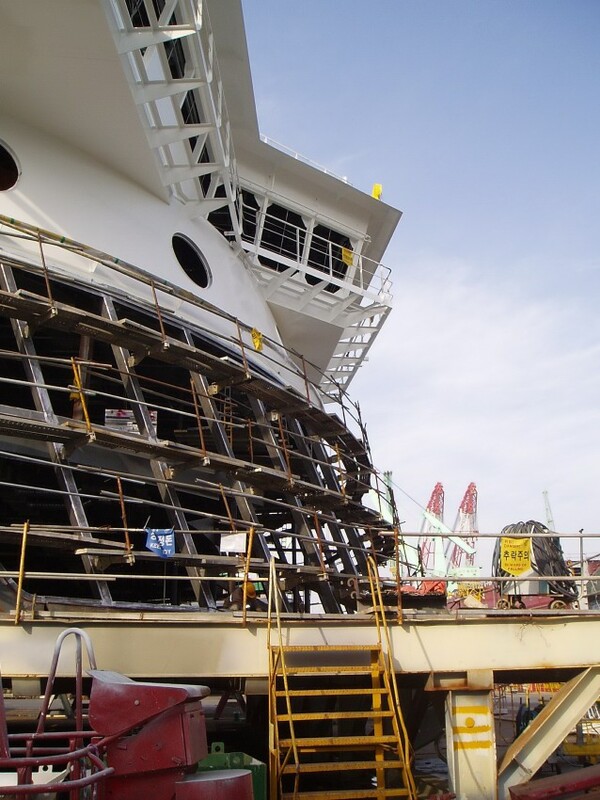 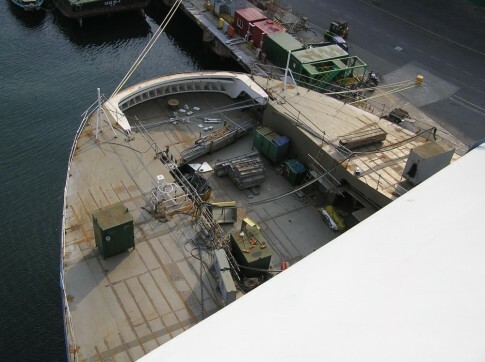 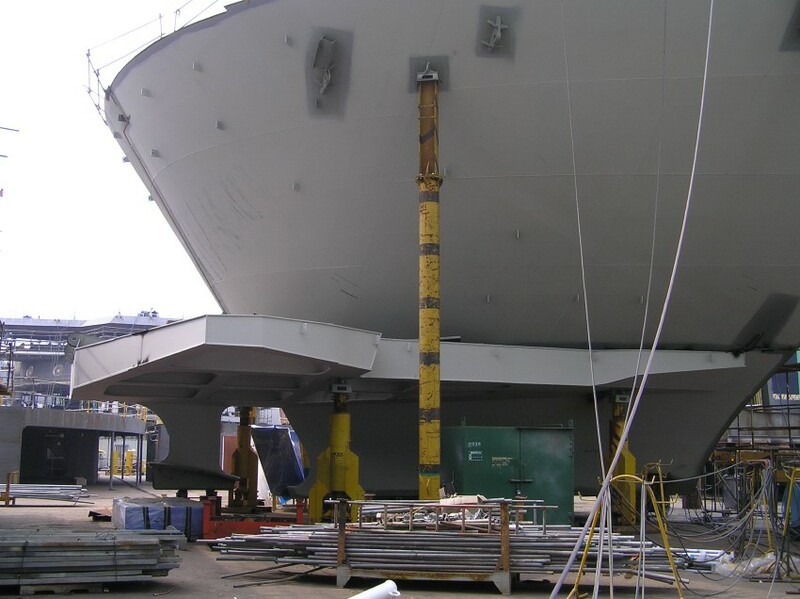 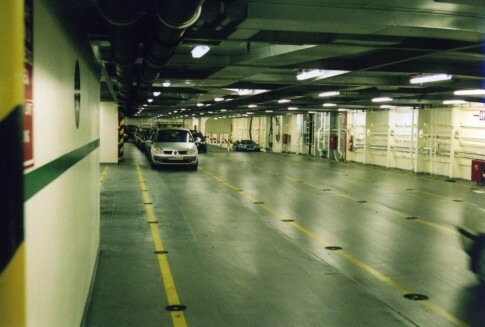 This post covers the vehicle decks and the lower of the two main passenger decks – Deck 6. 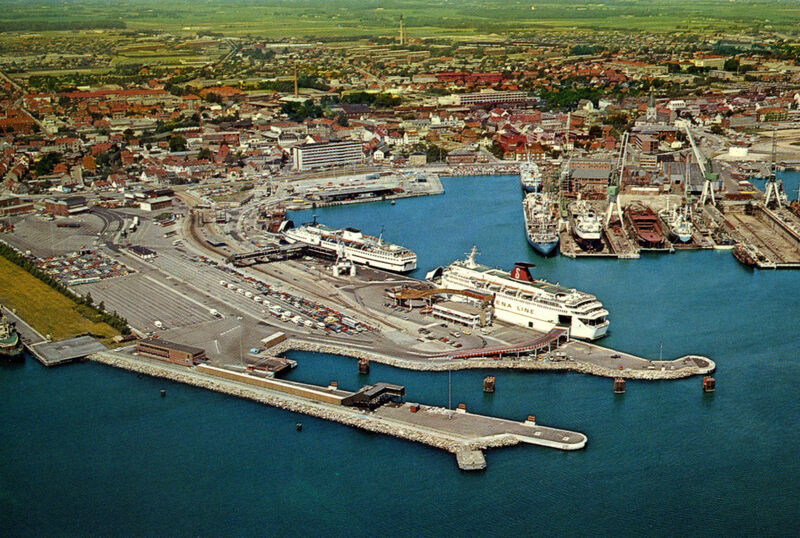 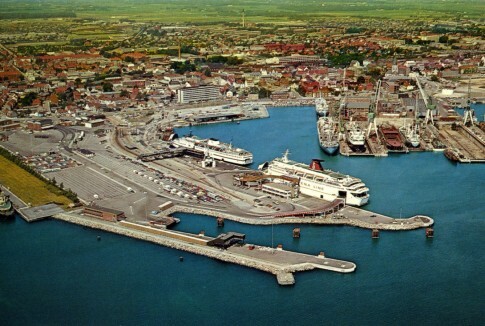 The ships have three vehicle decks - two lorry height, supposedly reserved for freight only (although I have seen passengers and cars loaded on these in the past) and one for cars only above. 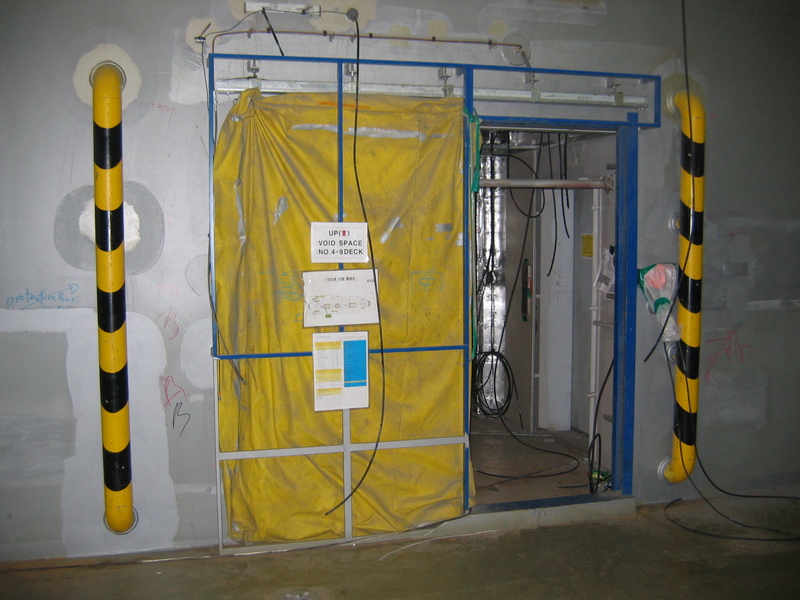 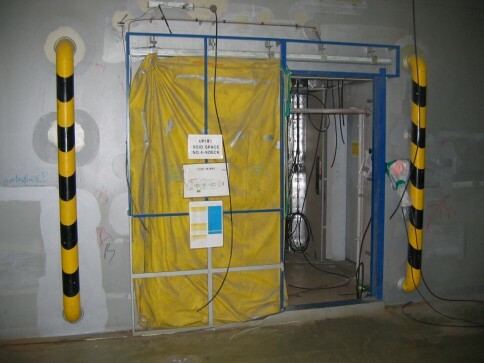 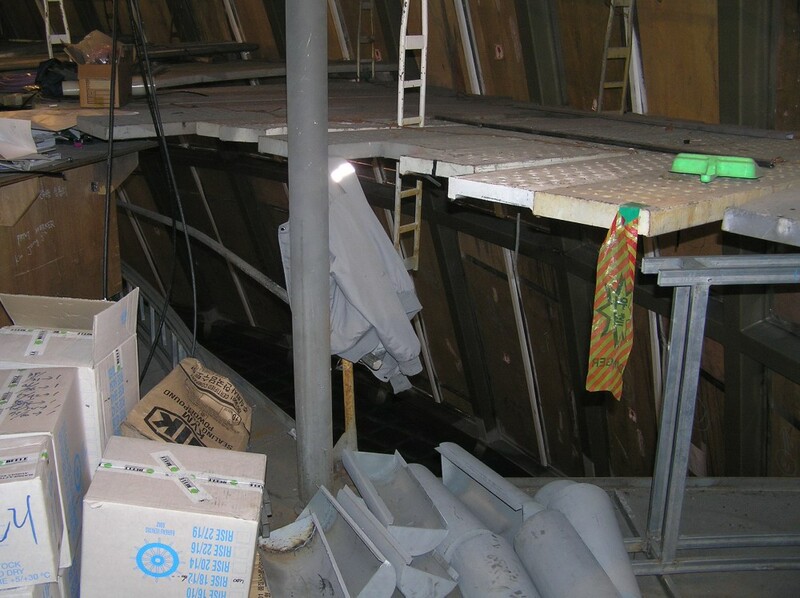 This view shows one of the doorways on the lower freight deck in July 2005. 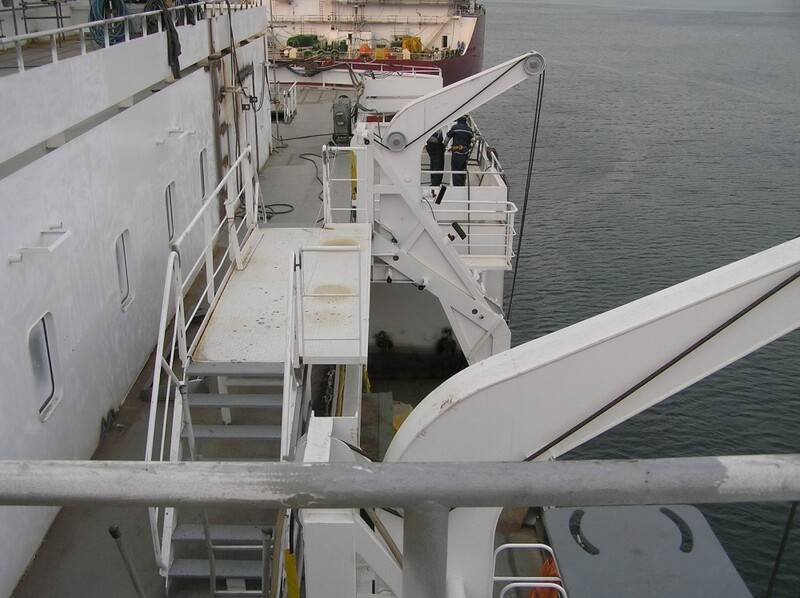 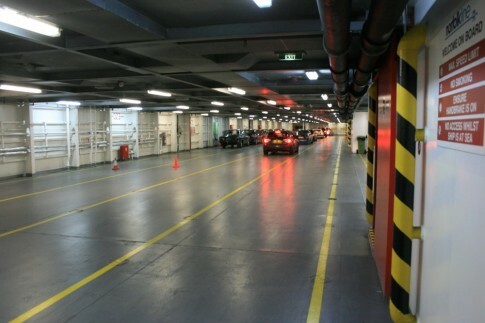 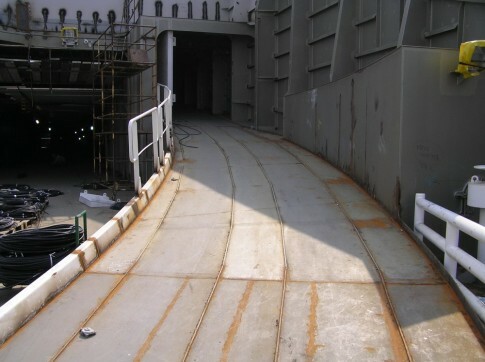 The car deck (Deck 5) is accessed via ramps on the starboard side at either end of the ship which feed traffic over the upper level of the two-tier linkspans at Dover and Dunkerque. 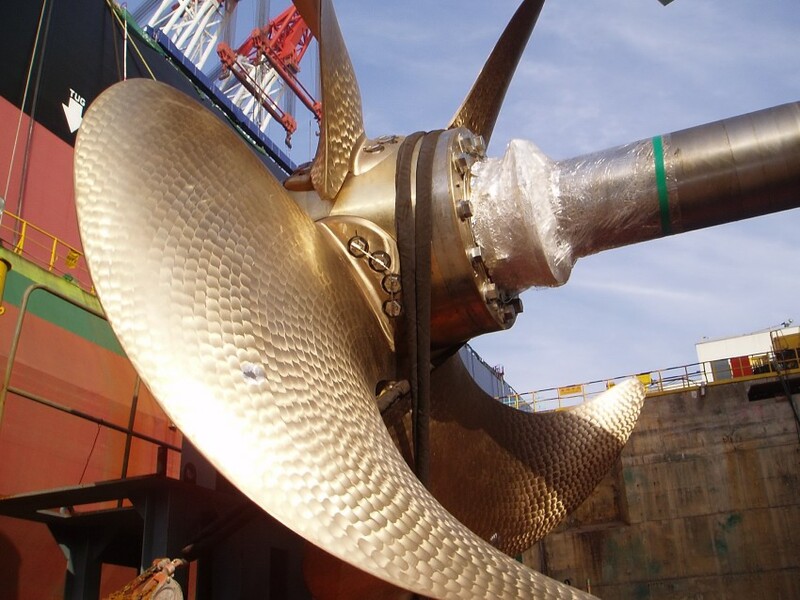 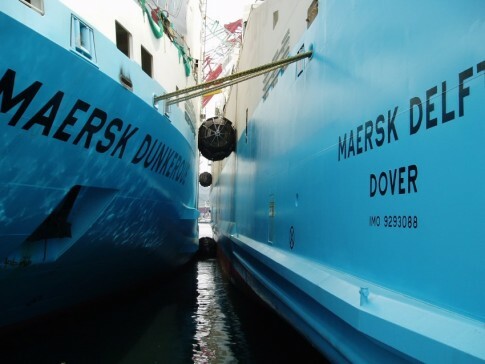 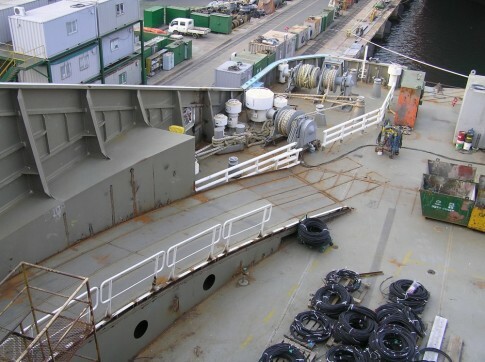 This shot is taken at the stern of the Maersk Dunkerque (March 2005). 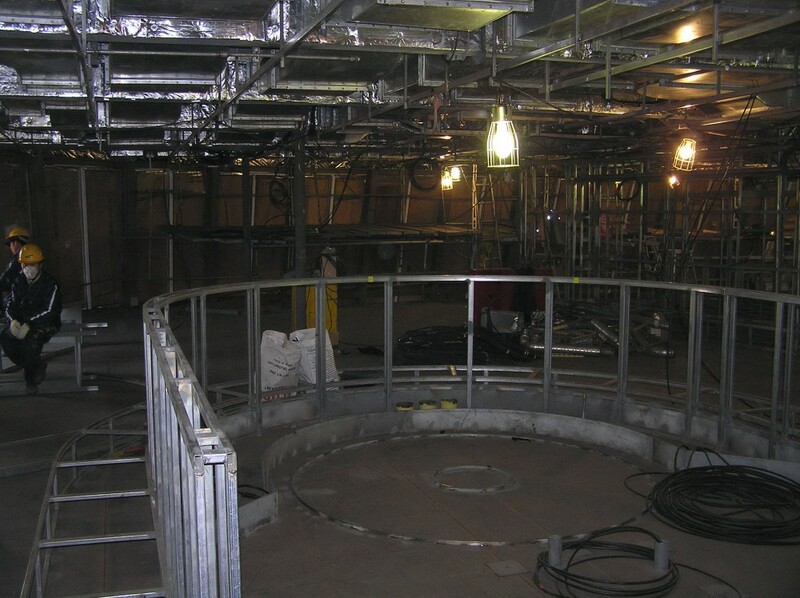 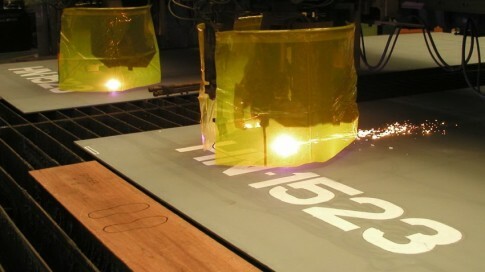 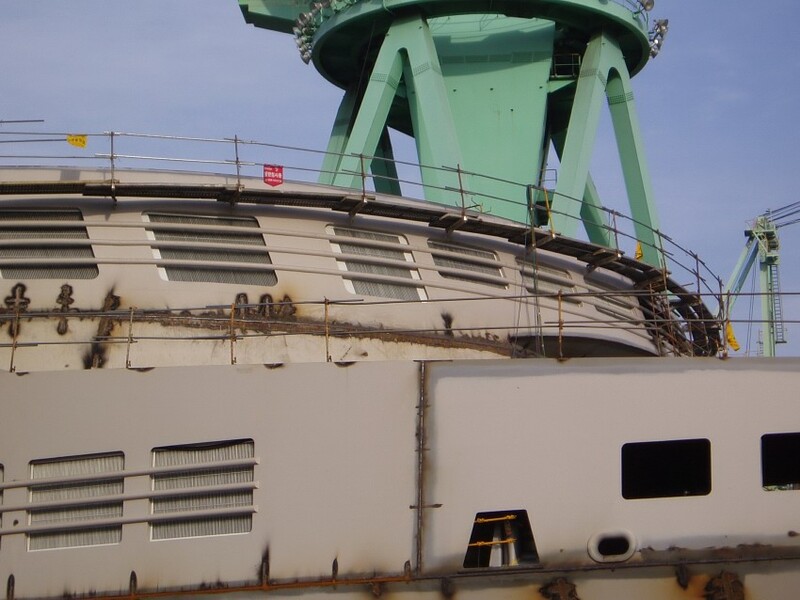 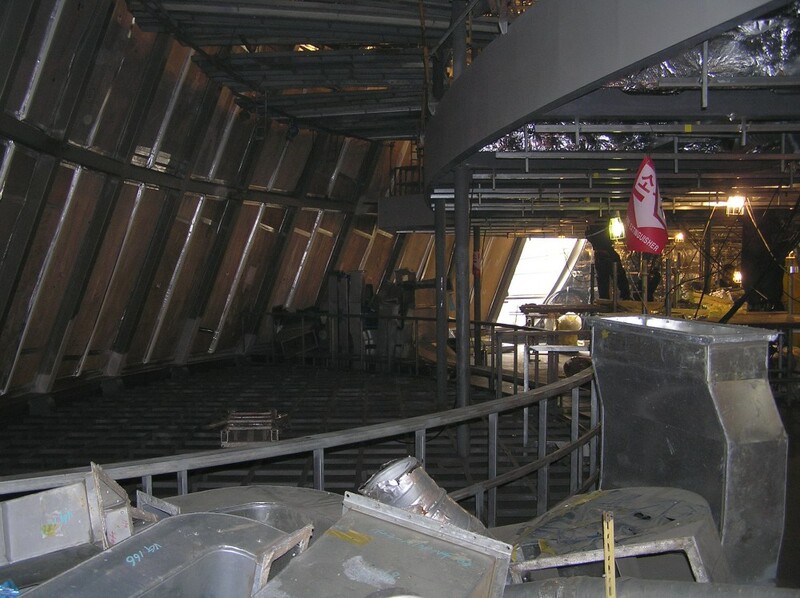 An overall view on Deck 5 (March 2005). 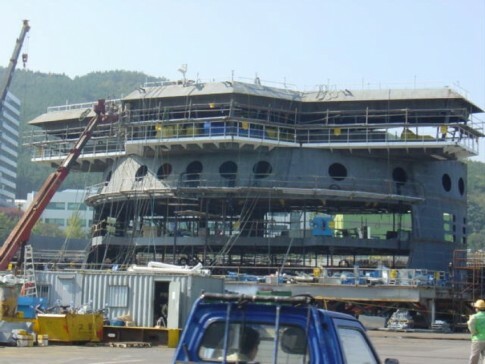 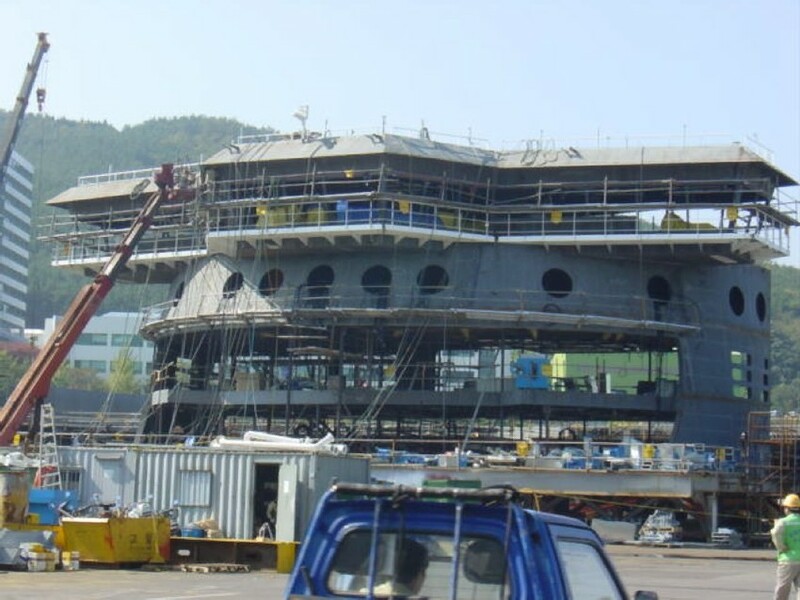 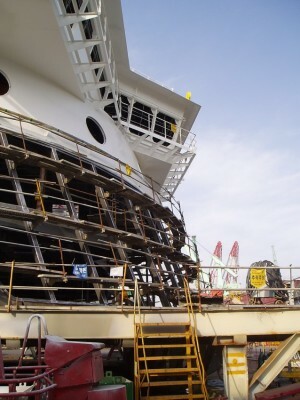 Looking forward on the port side of Deck 5 during construction (July 2005). 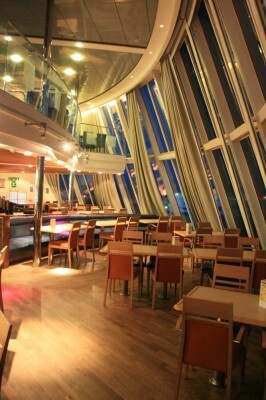 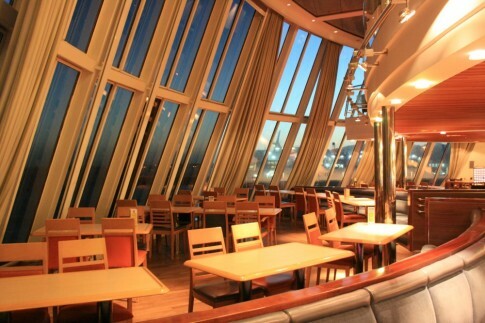 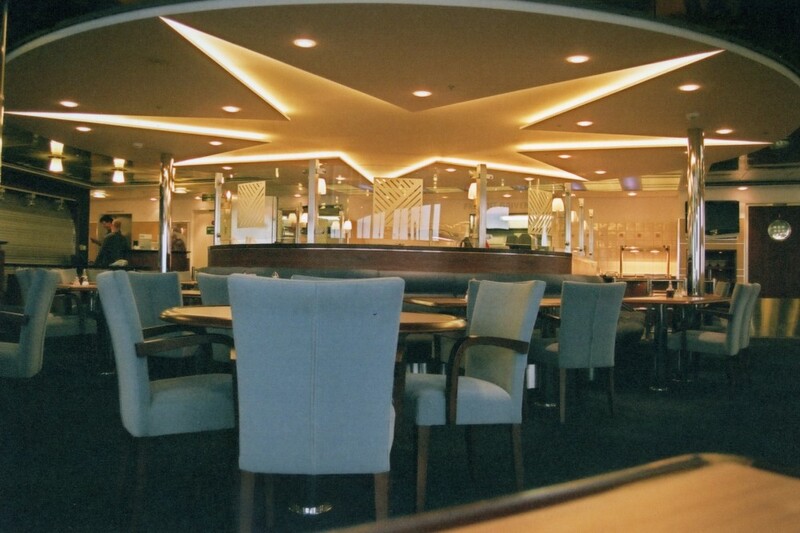 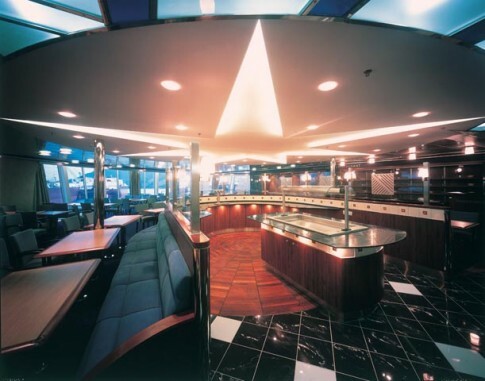 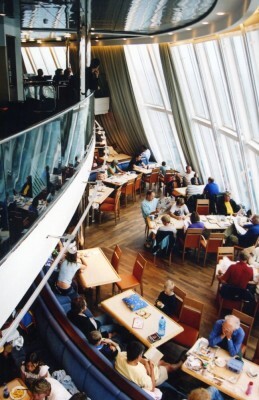 Right forward is the 'Panorama' self service restaurant, with the dramatic two-tier sweep of the forward windows. 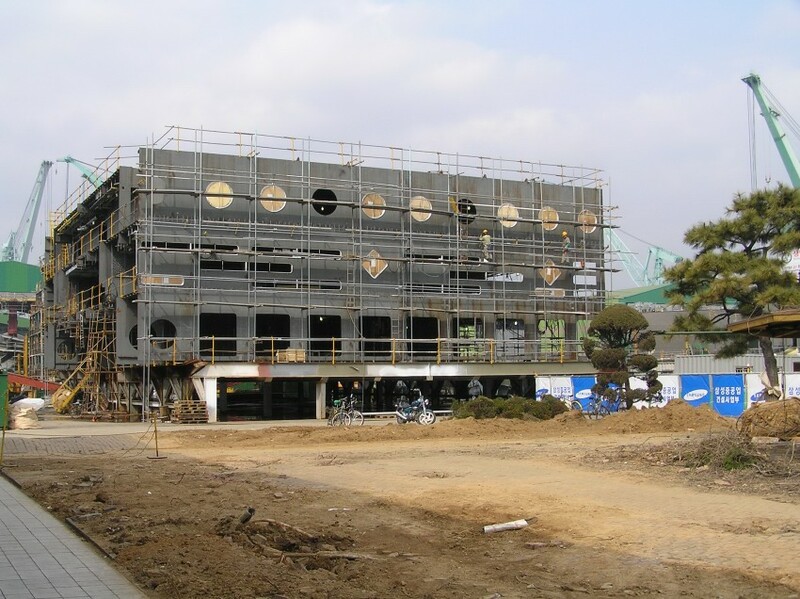 This early picture was taken in March 2005. 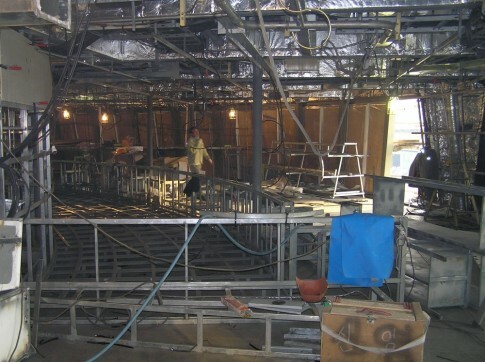 The same scene four months later (July 2005). 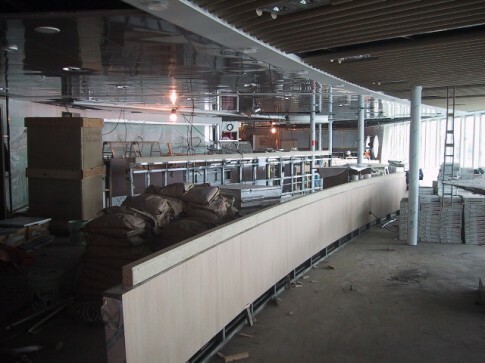 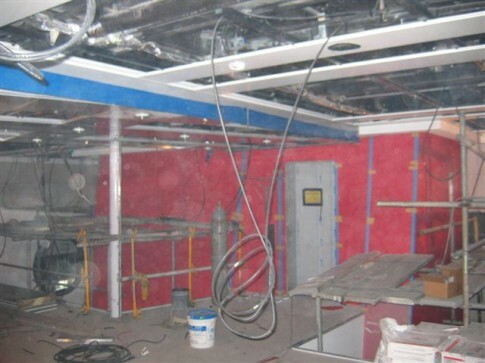 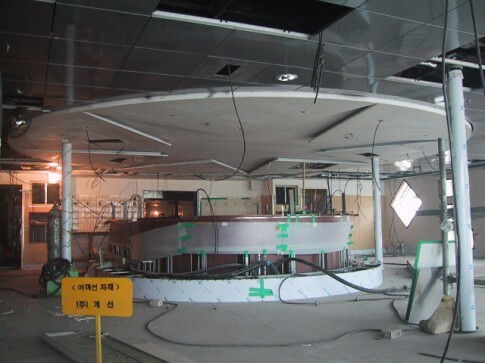 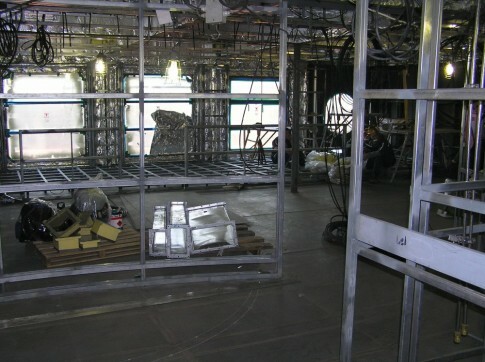 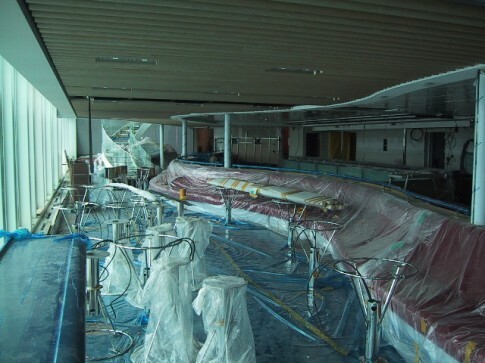 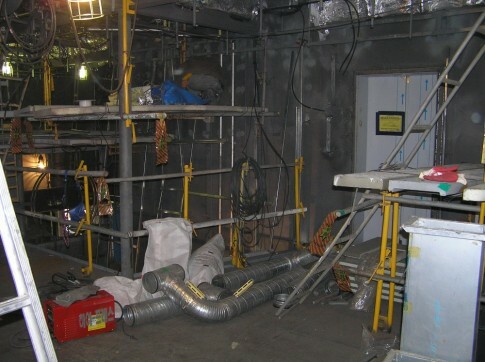 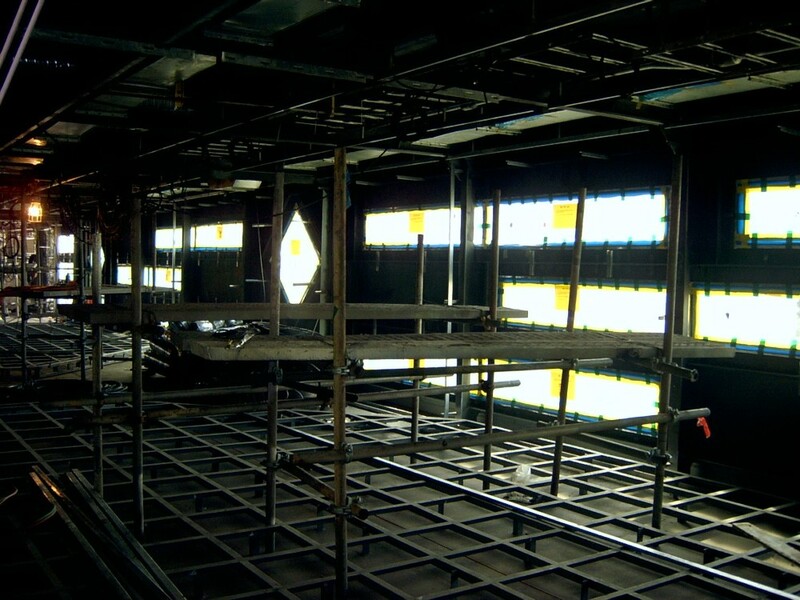 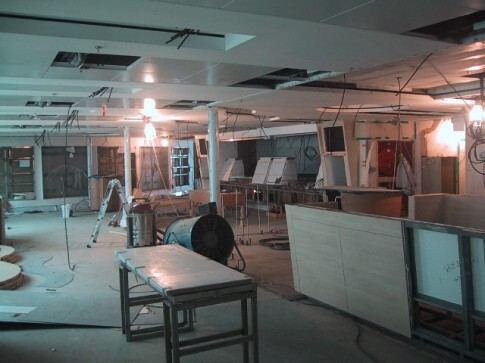 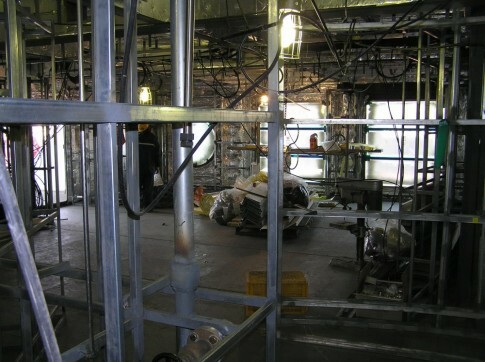 Looking across to the self service servery area (July 2005). Early days - January 2005. Looking forward and across to starboard (July 2005). 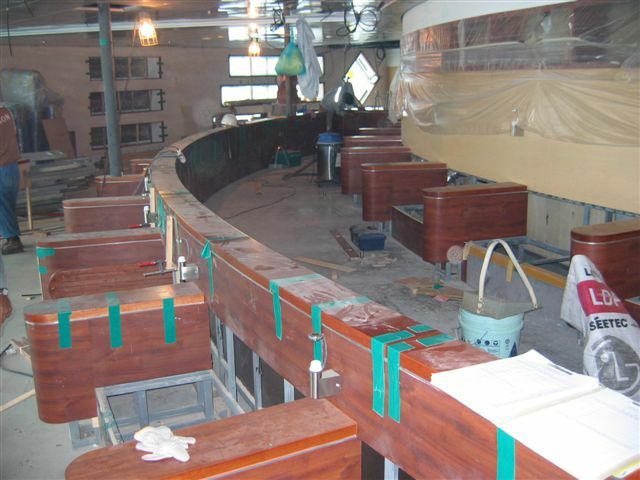 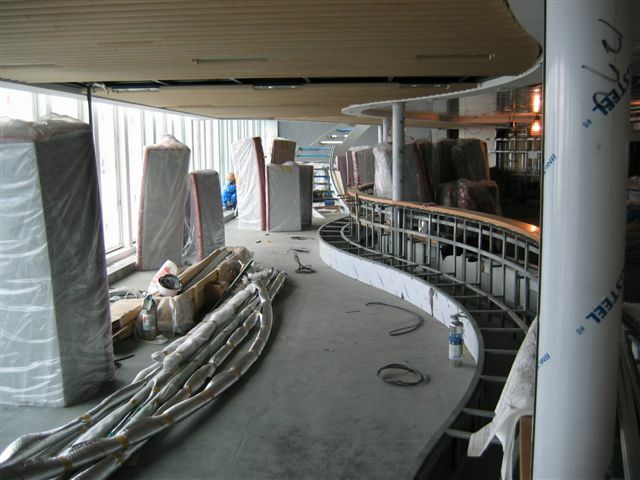 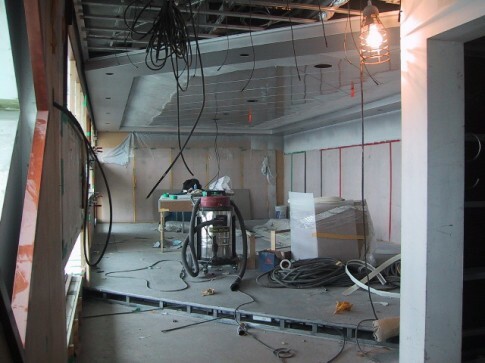 The servery area (background) with sofa style seating under construction in the foreground (July 2005). An overall view of the completed servery (Maersk Dunkerque). 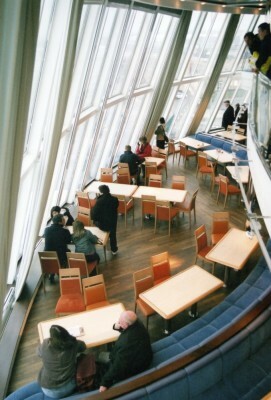 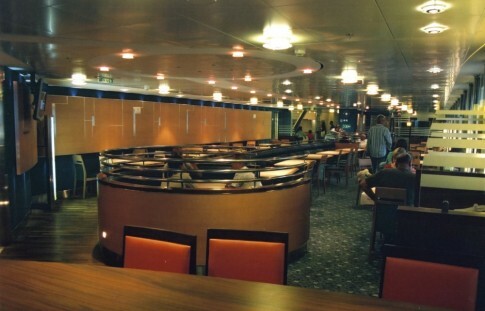 Heading aft on the port side, there is further cafeteria seating (July 2005). Aft of the seating area described above was originally a small lounge designated the 'Corporate Quarter' for use by private parties. 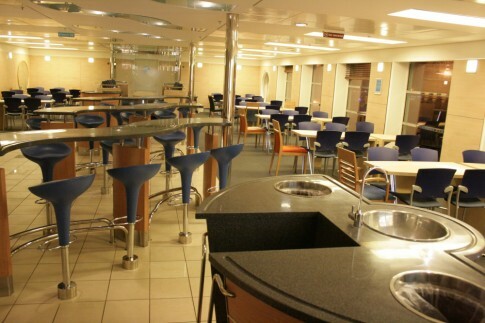 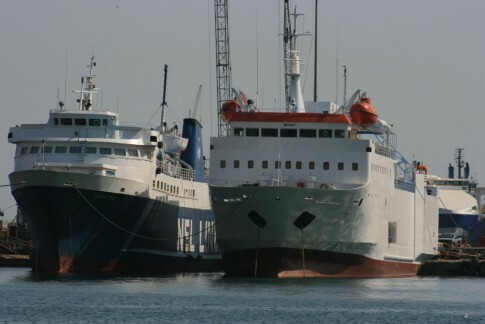 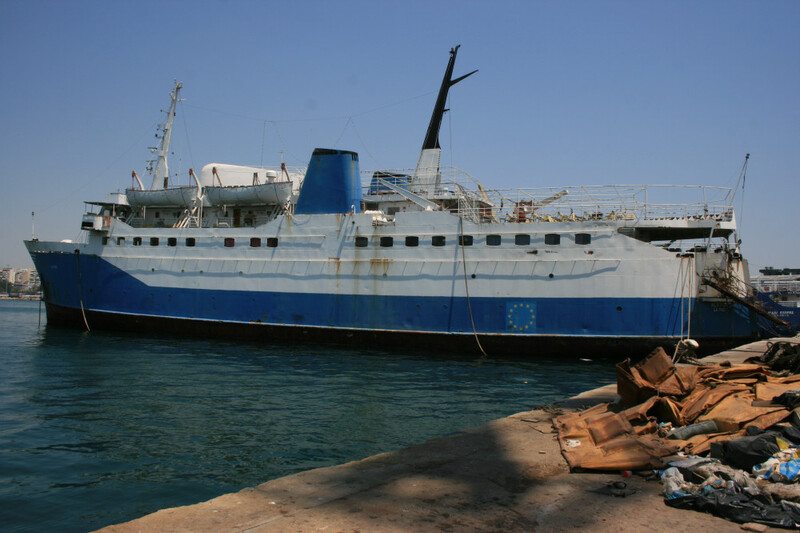 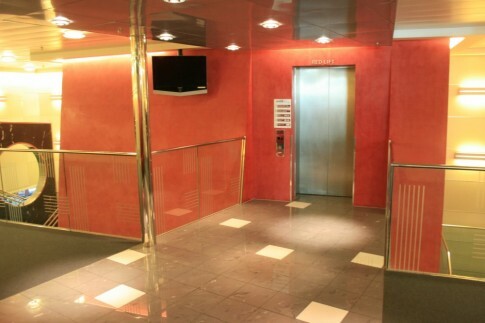 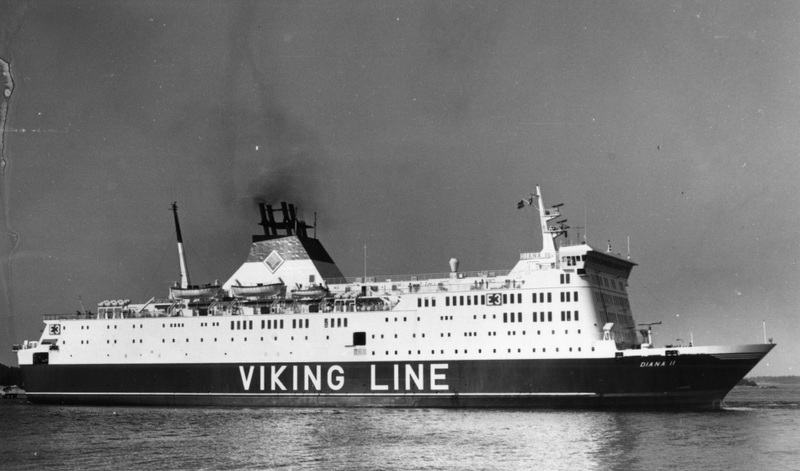 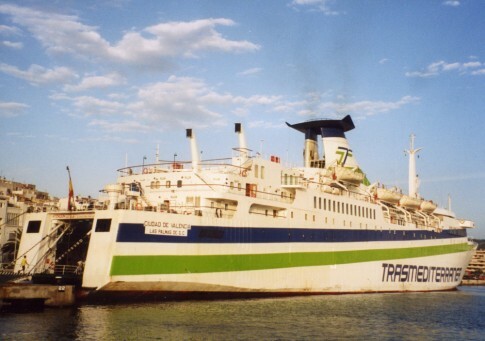 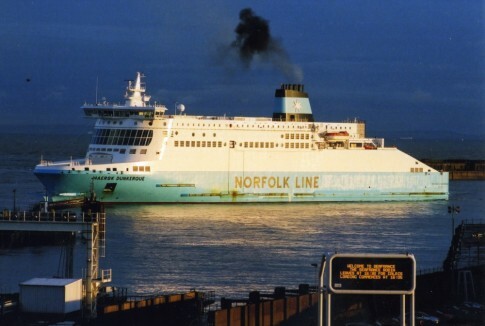 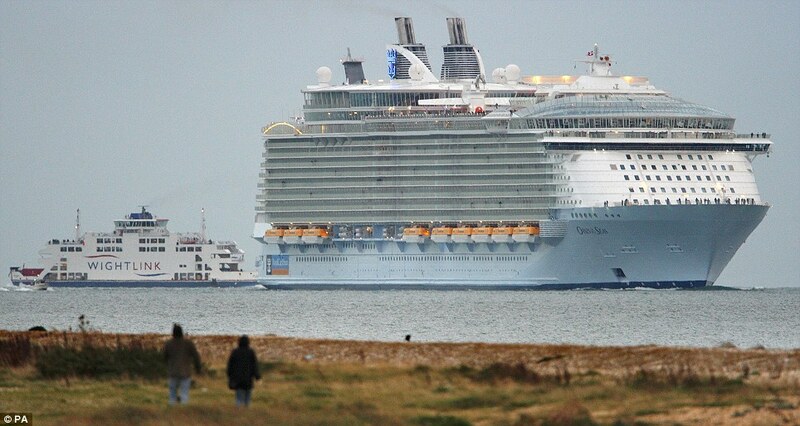 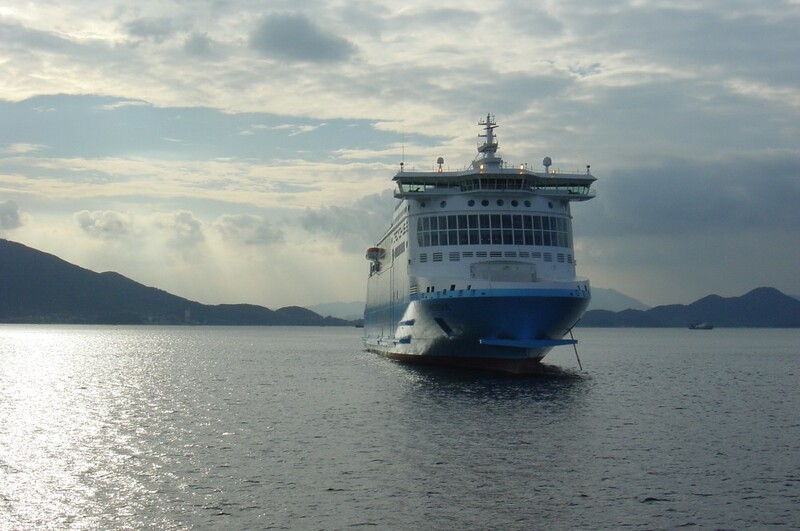 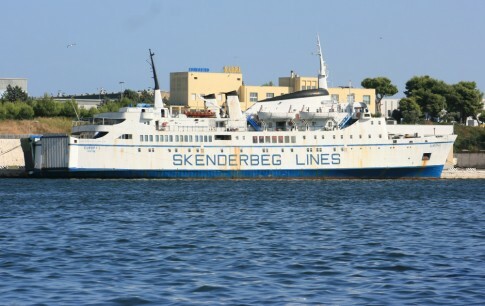 Little used, it has since been converted on all three ships into additional toilet facilities. 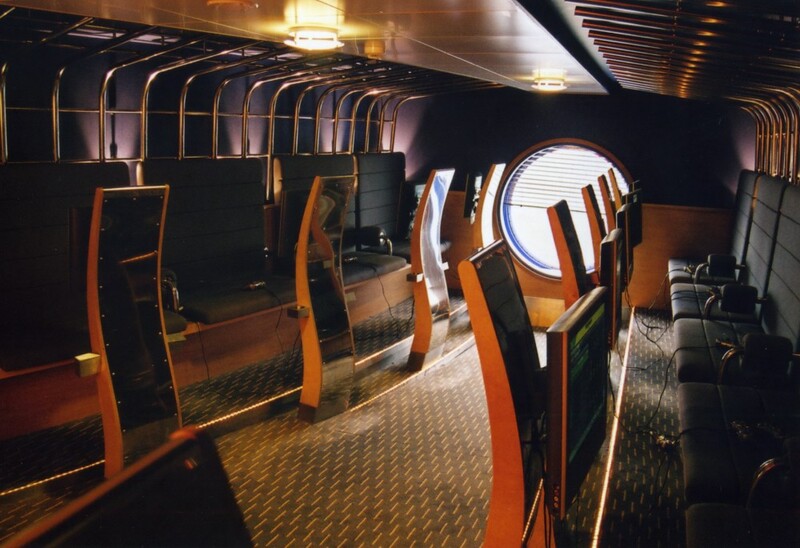 The Corporate Quarter as it was aboard the Maersk Dover in 2006. 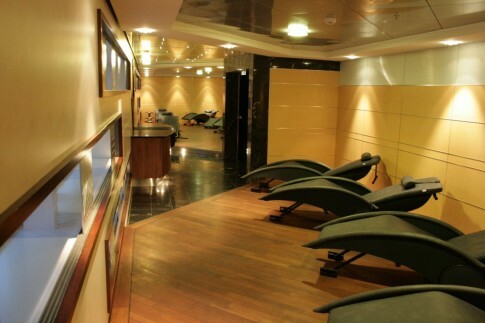 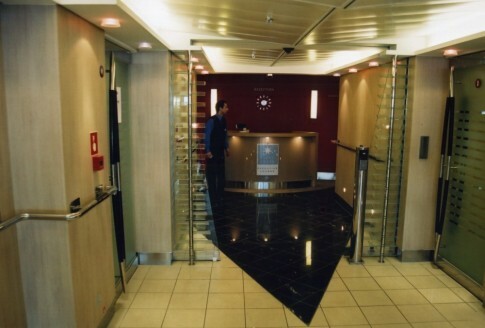 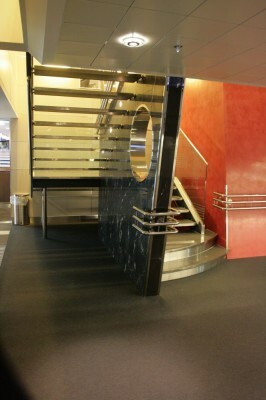 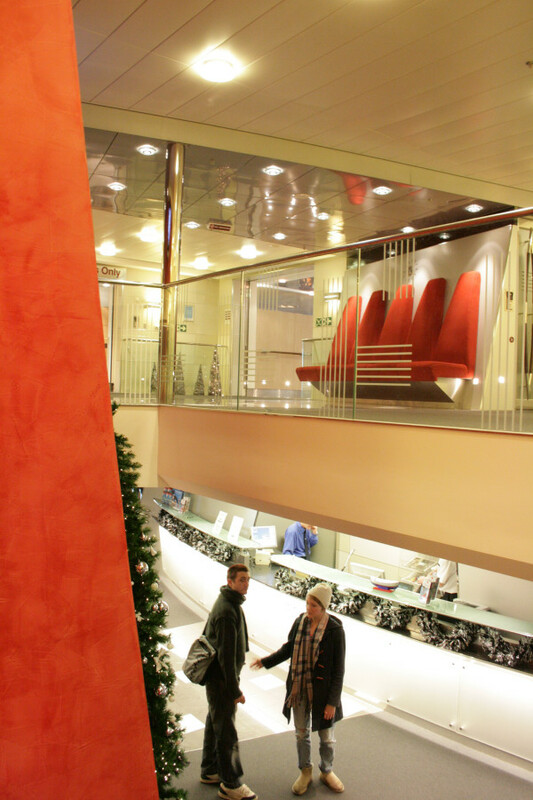 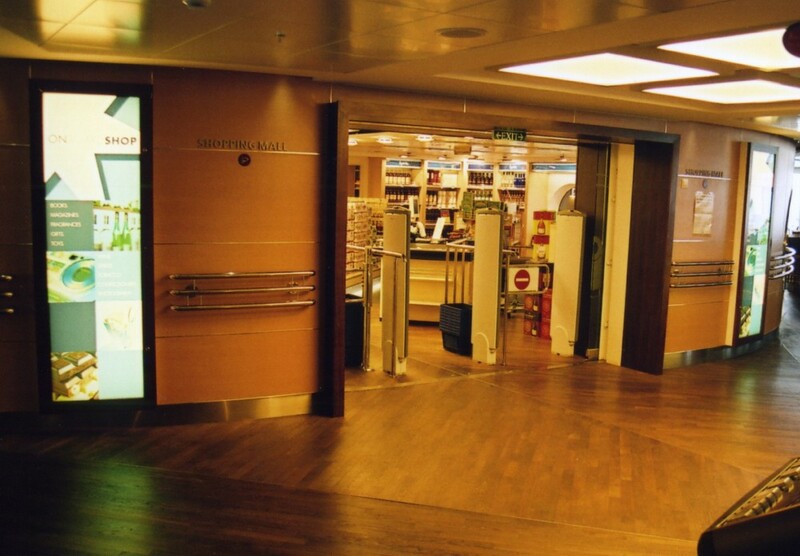 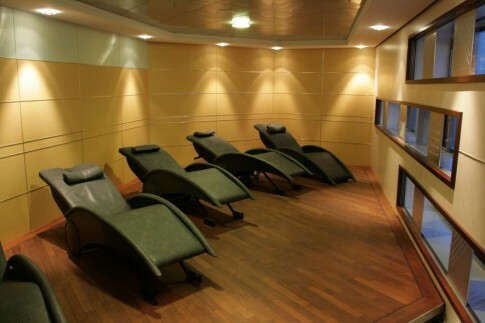 Inboard of the Corporate Quarter is the striking main lobby, seen here on the Maersk Dover. 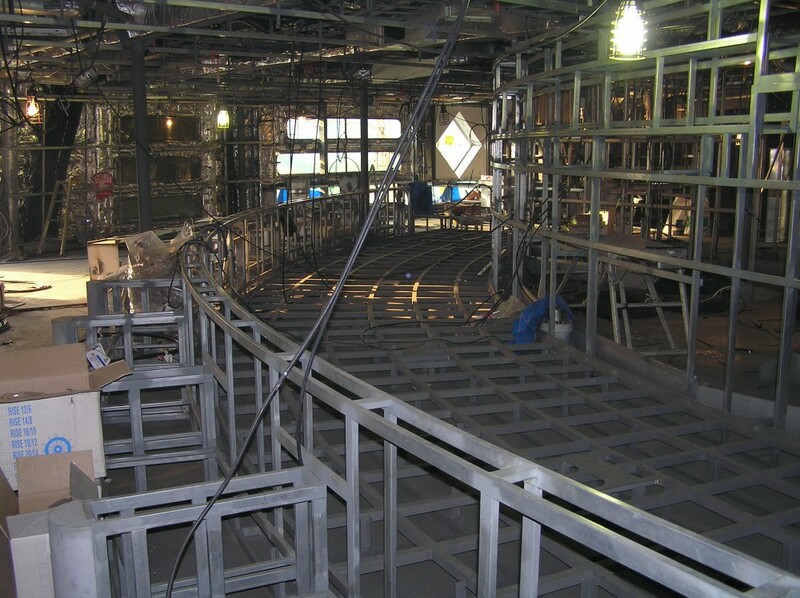 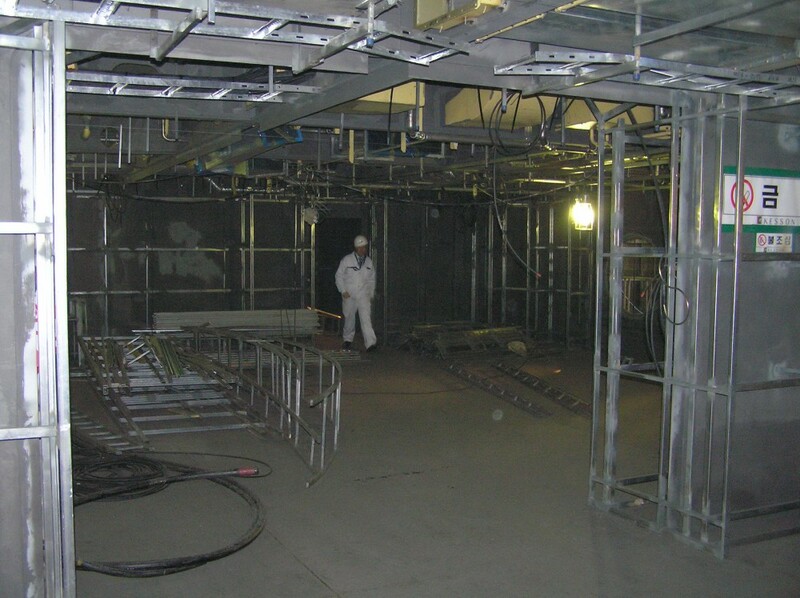 The lobby area under construction. 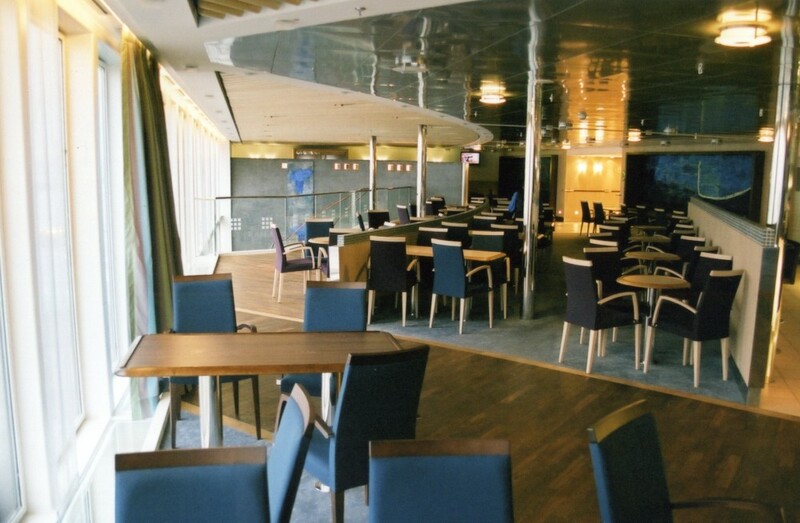 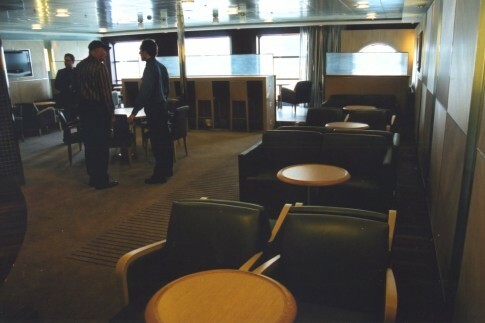 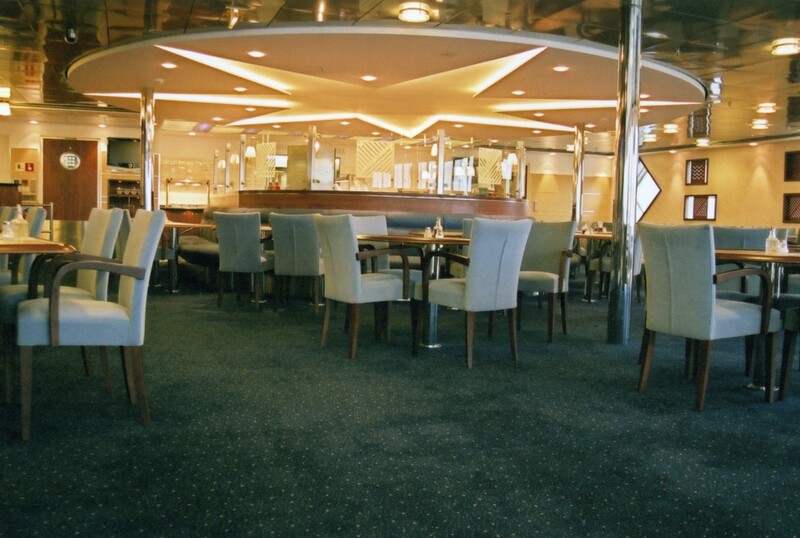 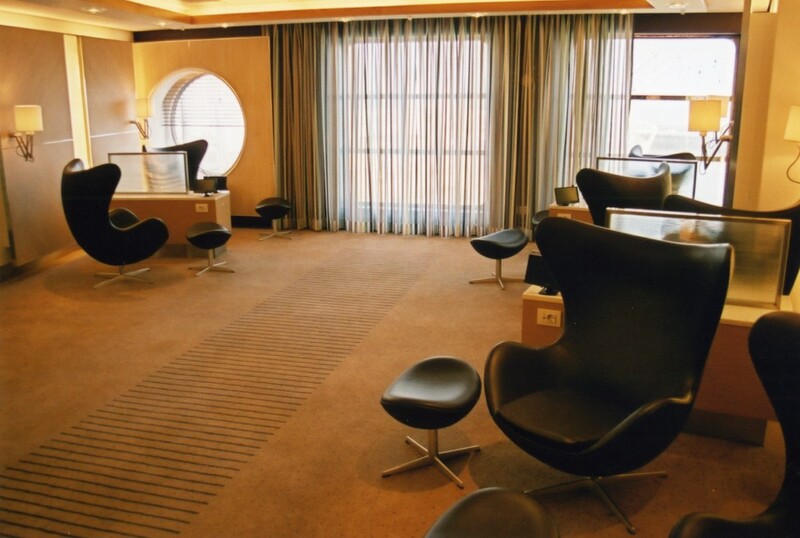 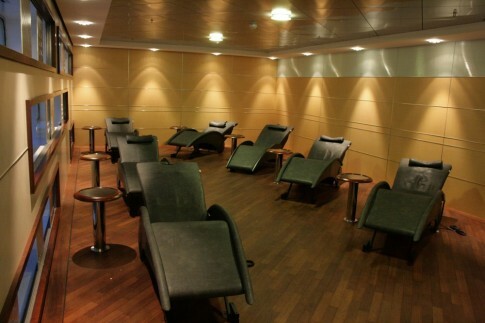 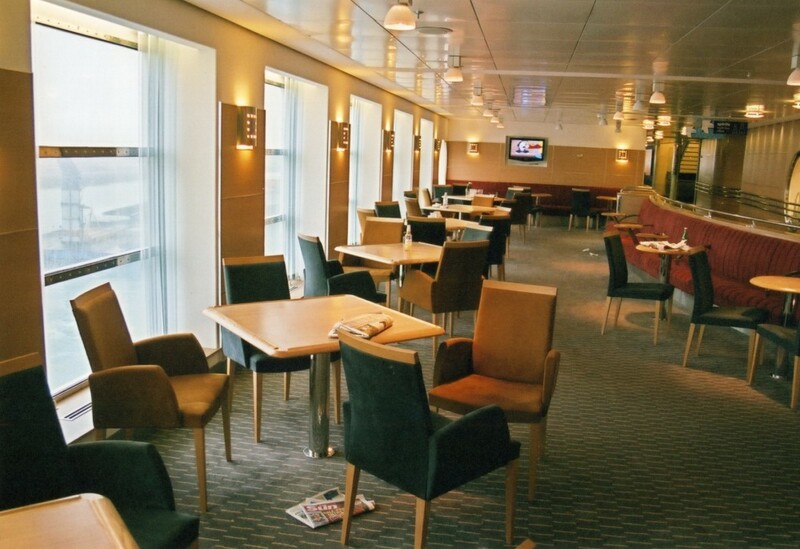 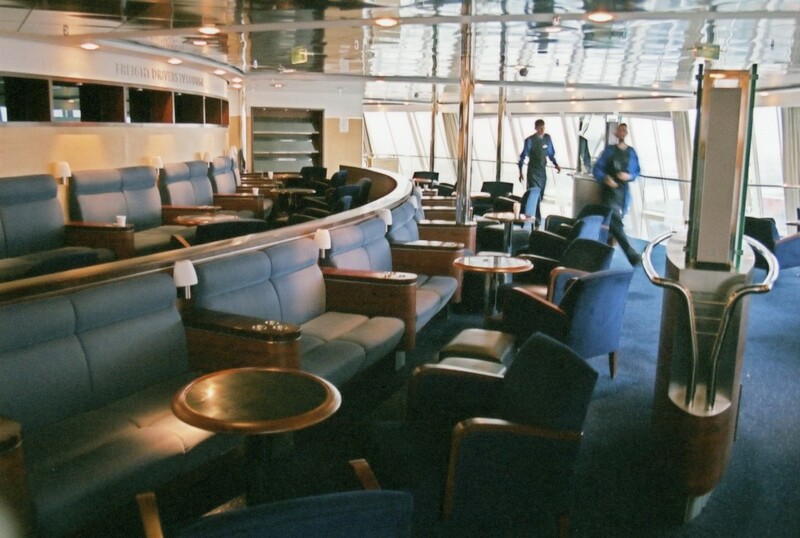 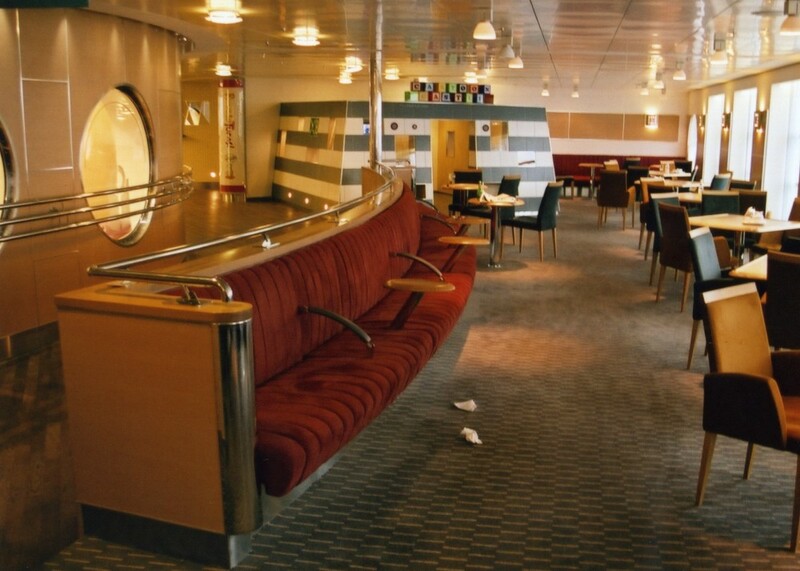 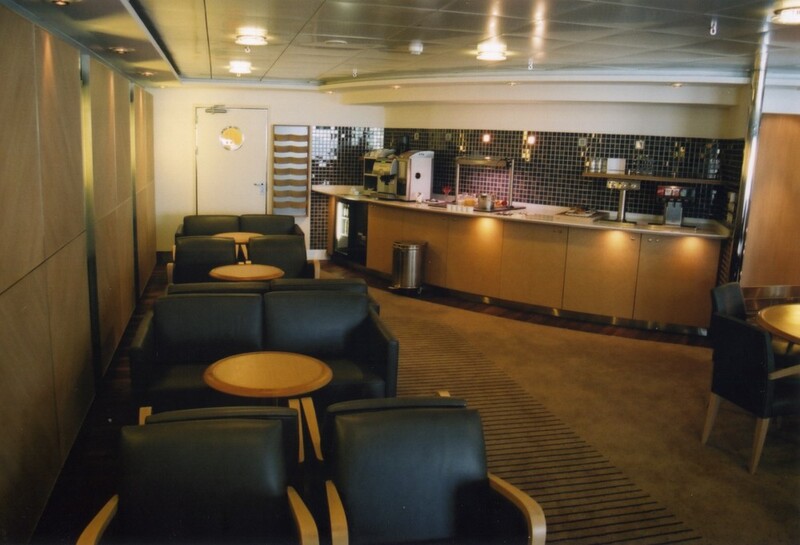 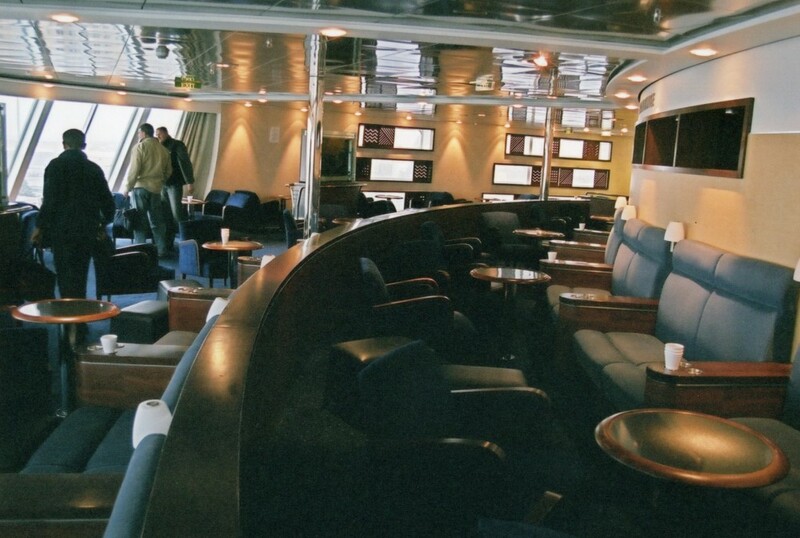 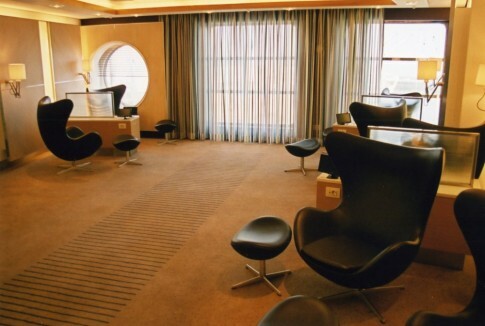 Continuing aft on the port side, next is the family lounge, the forward quarter of which is seen here (July 2005). Another view, looking forward. 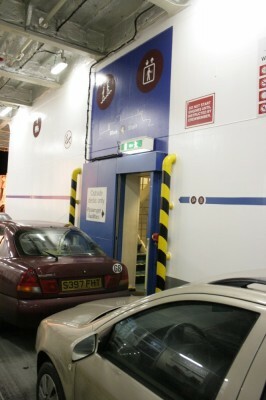 The shop is on the right hand side. 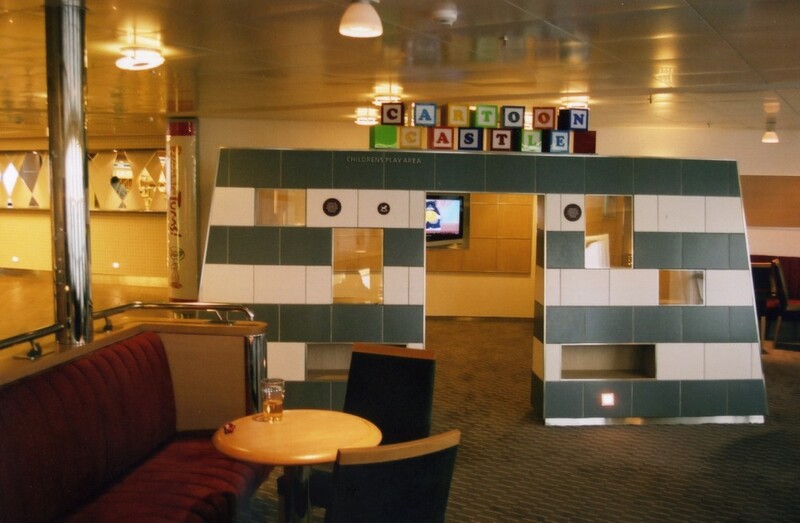 Looking aft (June 2005) with the 'Cartoon Castle' in the background. The same area a little later as building progressed. The entrance to the shop (March 2005). 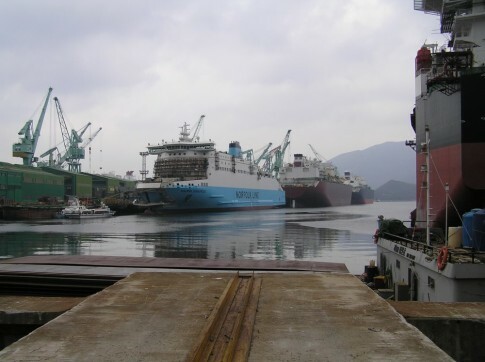 The same area on Maersk Delft. 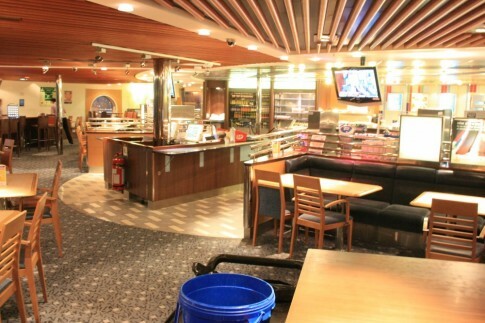 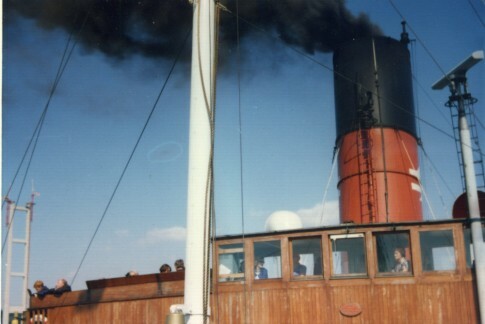 Right aft in the internal accommodation on the port side was this fast food restaurant, Rumble Tums (seen on Maersk Dover). 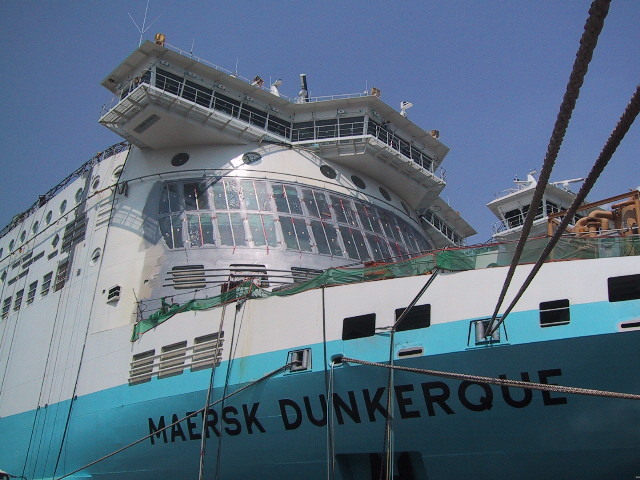 Rumble Tums on the Maersk Dunkerque in June 2005. 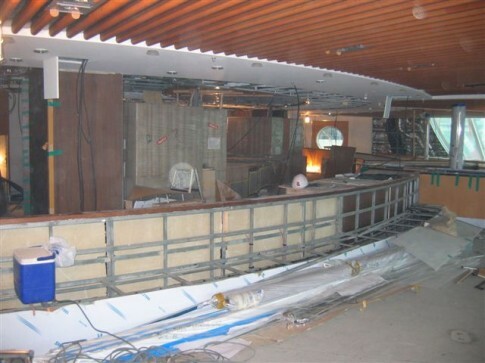 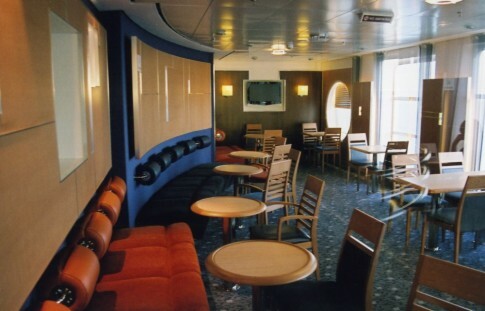 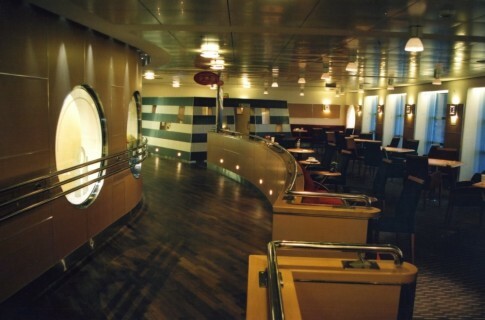 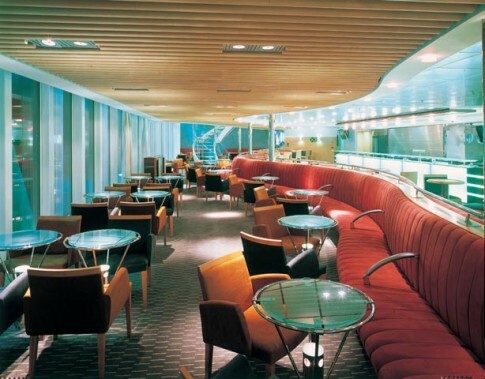 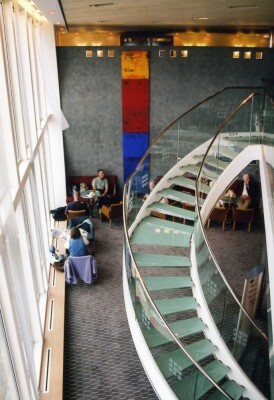 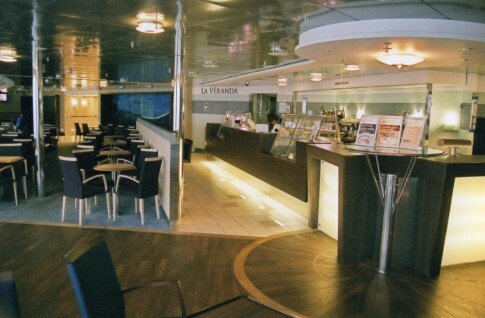 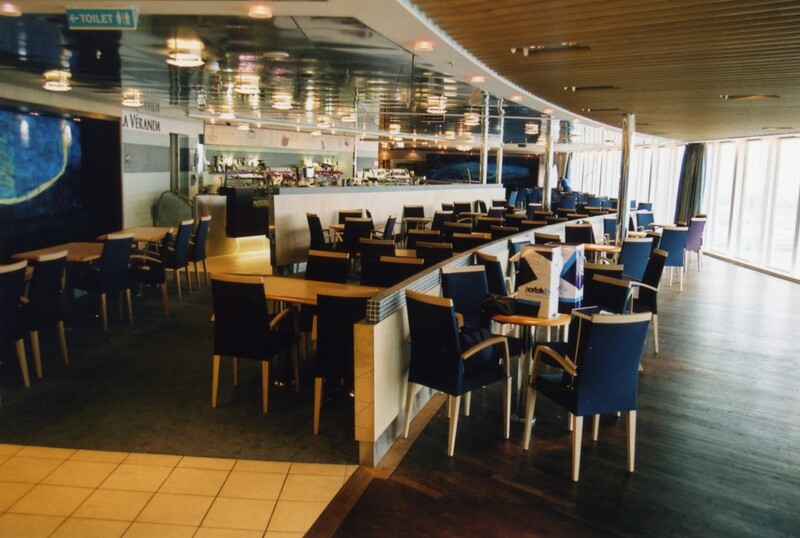 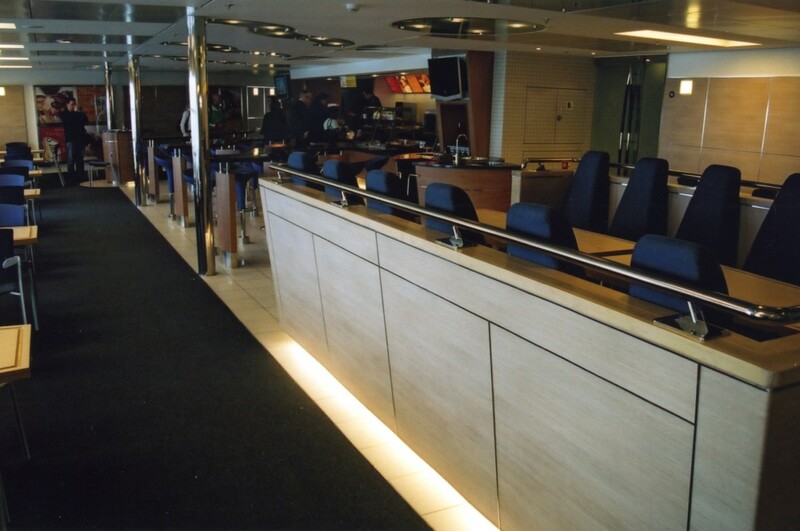 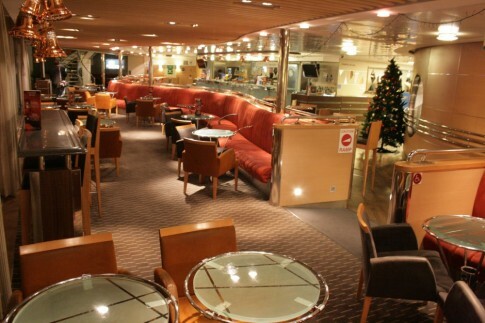 On the starboard side aft is The Lounge cafe bar, with a curved staircase leading up to the mezzanine level above (seen in June 2005). 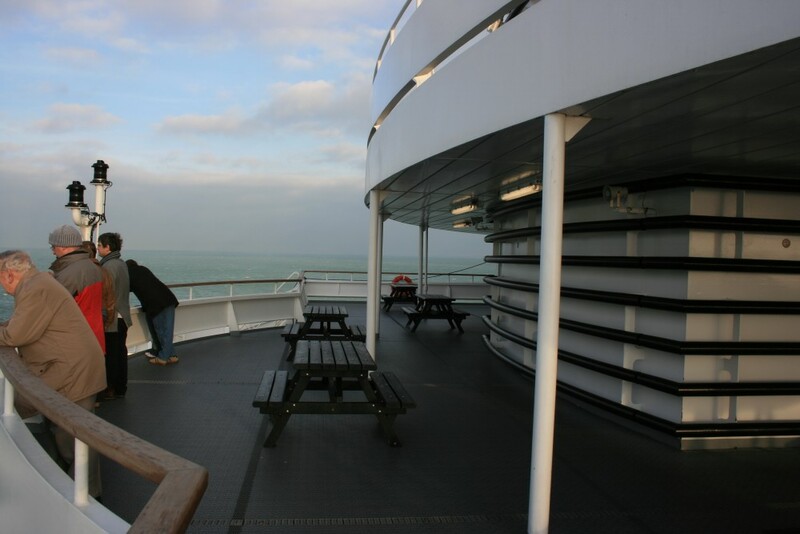 The same area on the 'Dunkerque', Christmas 2007. 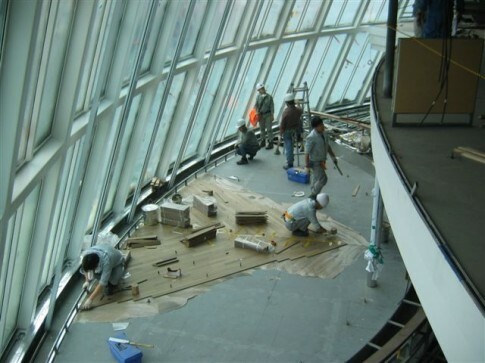 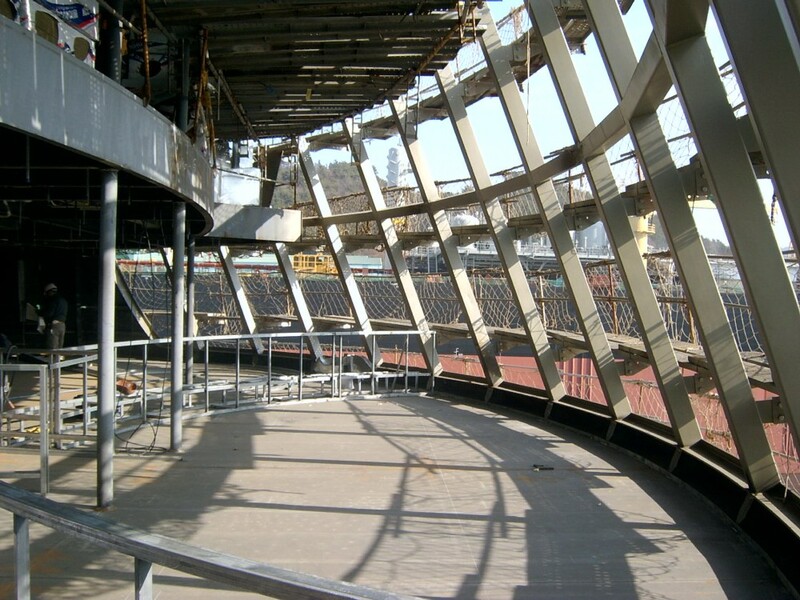 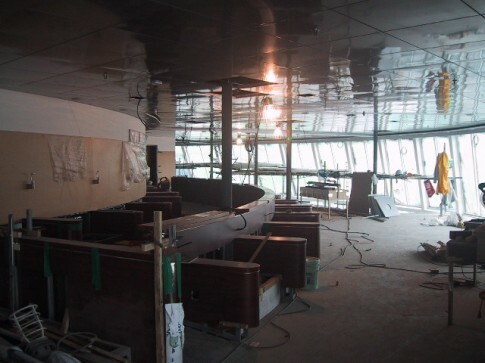 In this later view, taken in July 2005, the furnishings are now mostly in place. 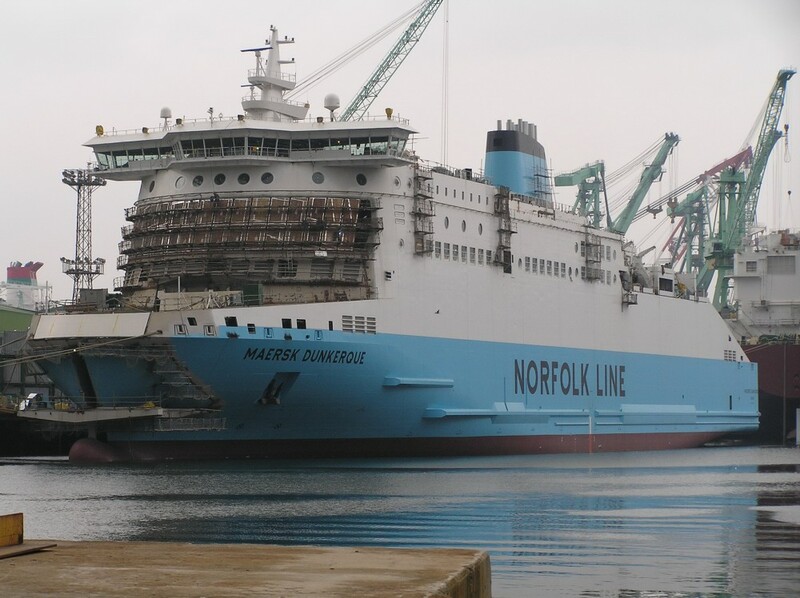 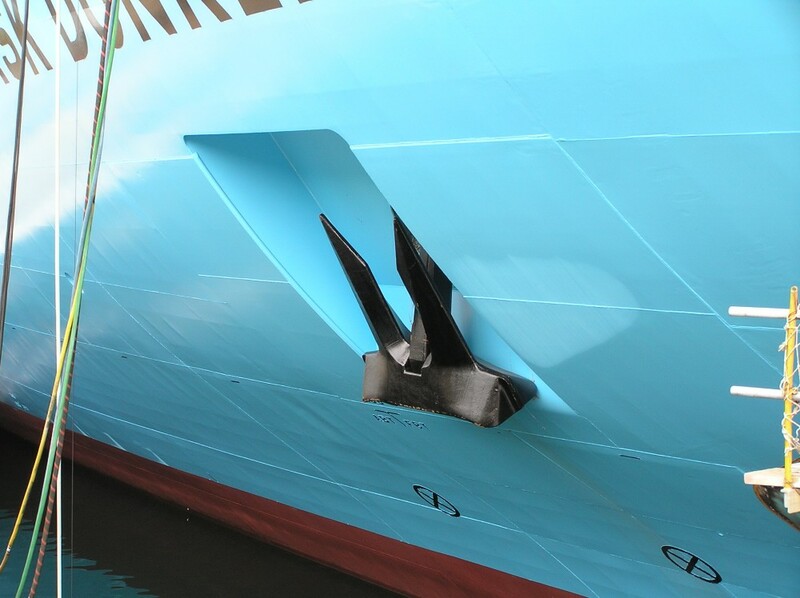 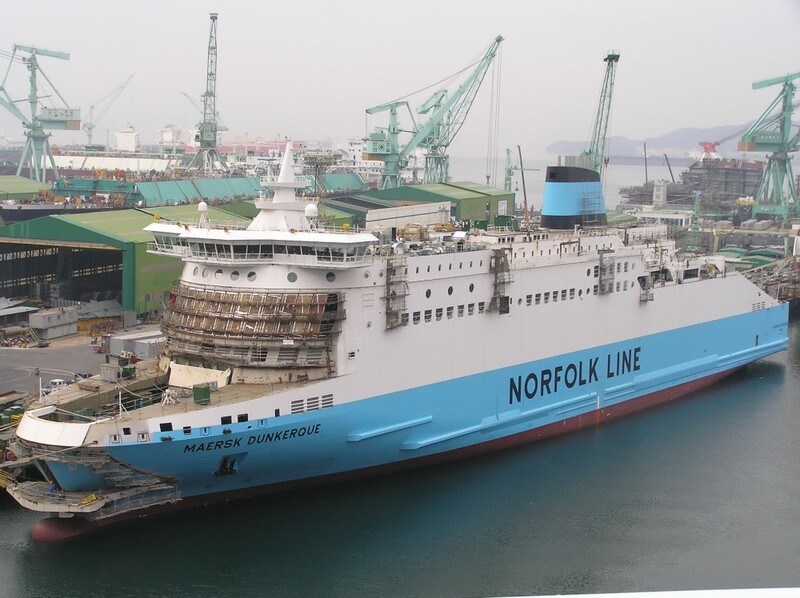 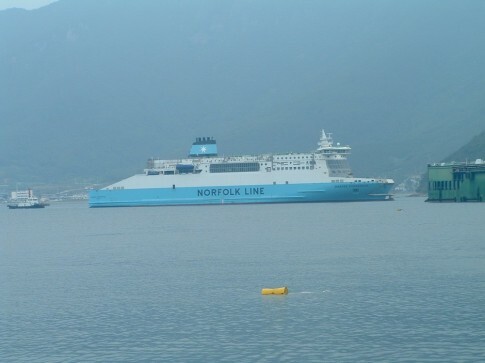 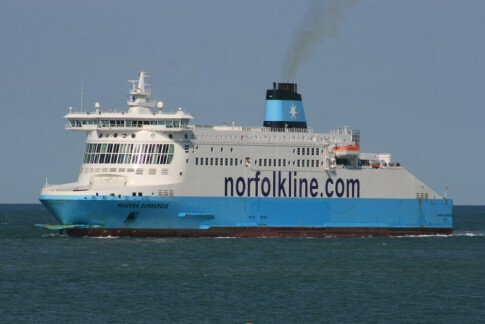 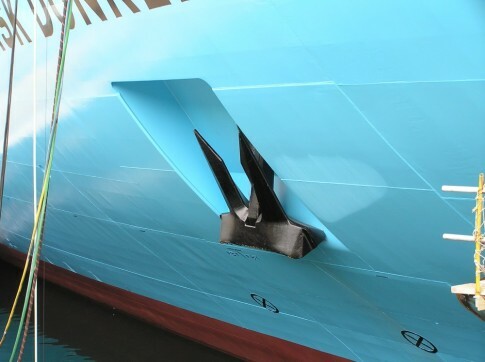 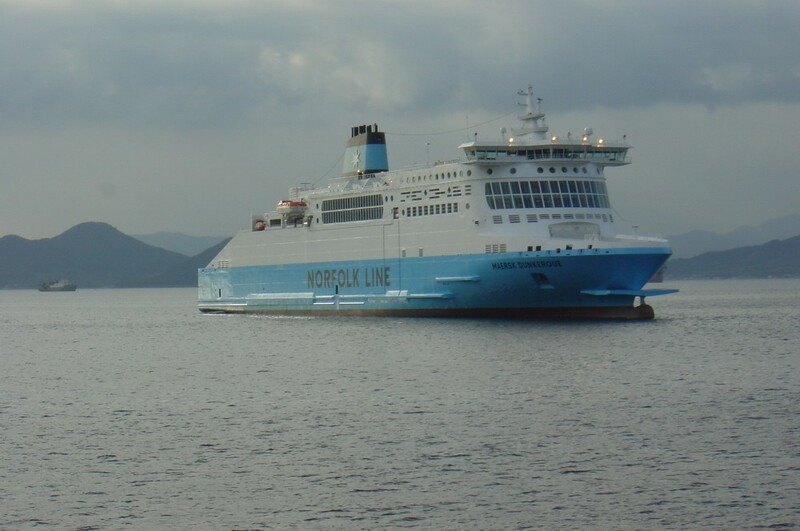 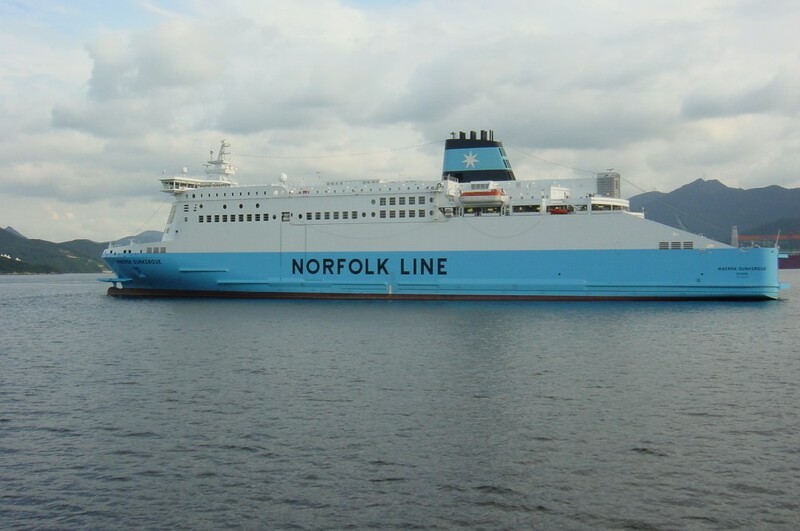 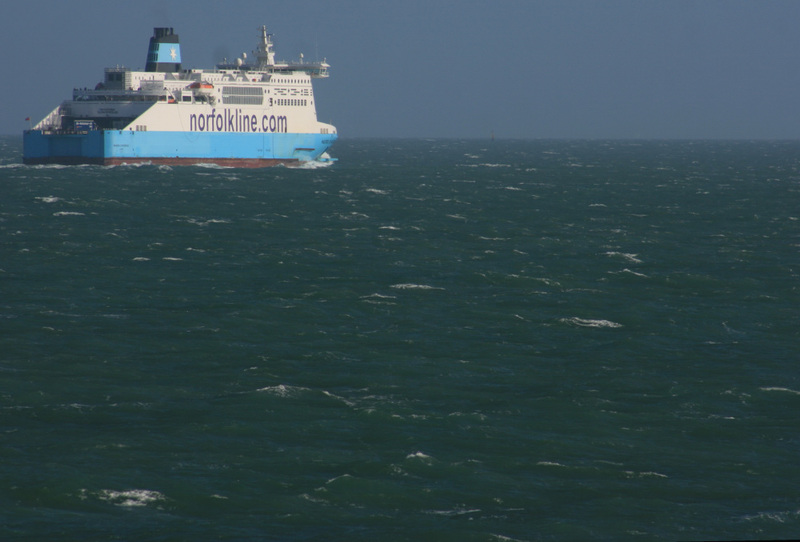 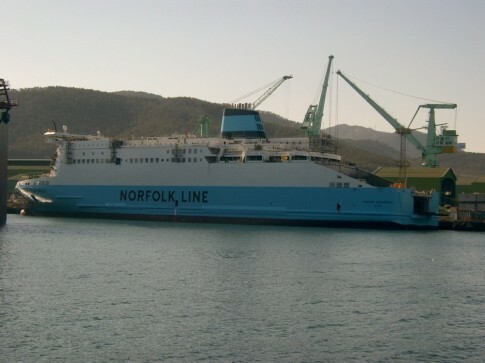 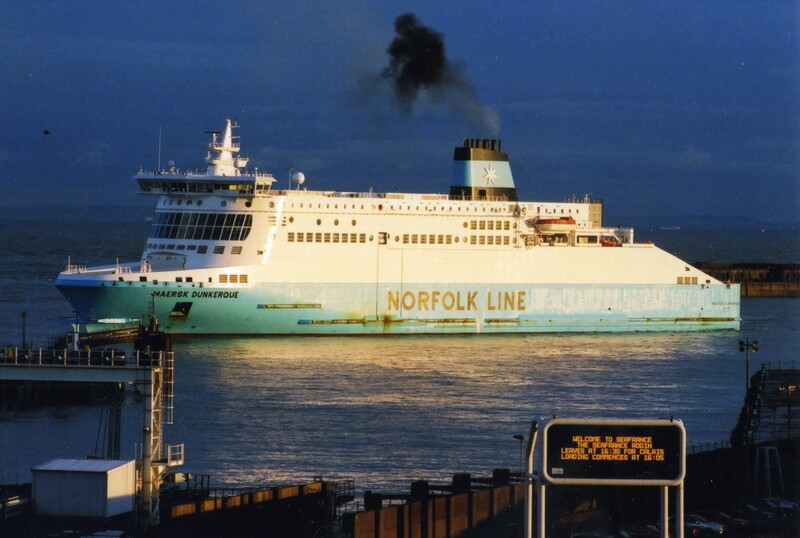 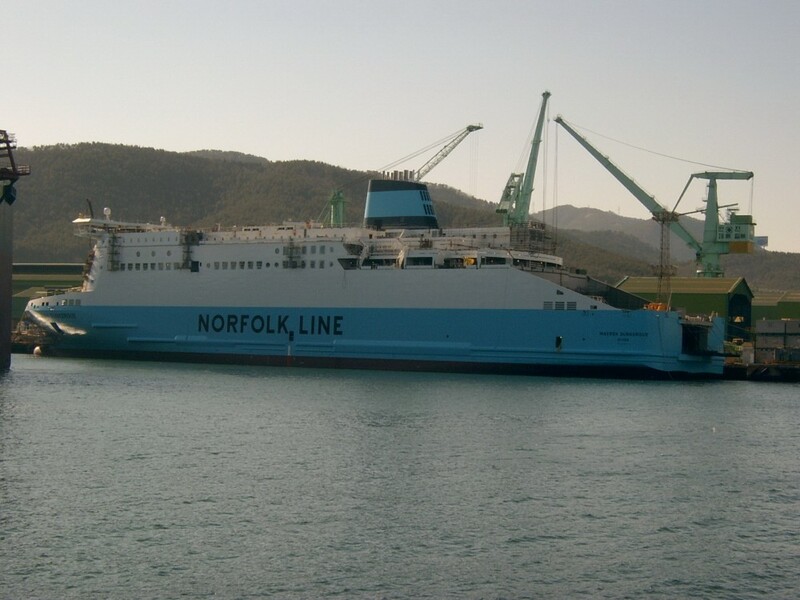 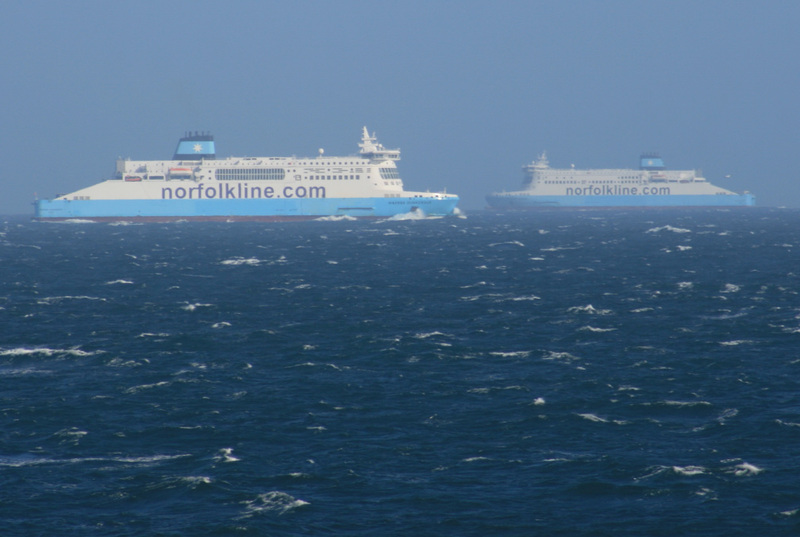 Norfolkline image on the Maersk Dunkerque as completed. 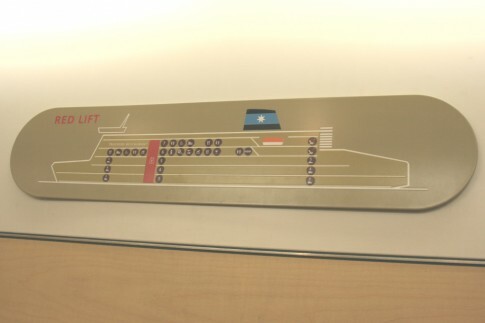 On board the Maersk Dover, with decorative panel by Per Arnoldi. 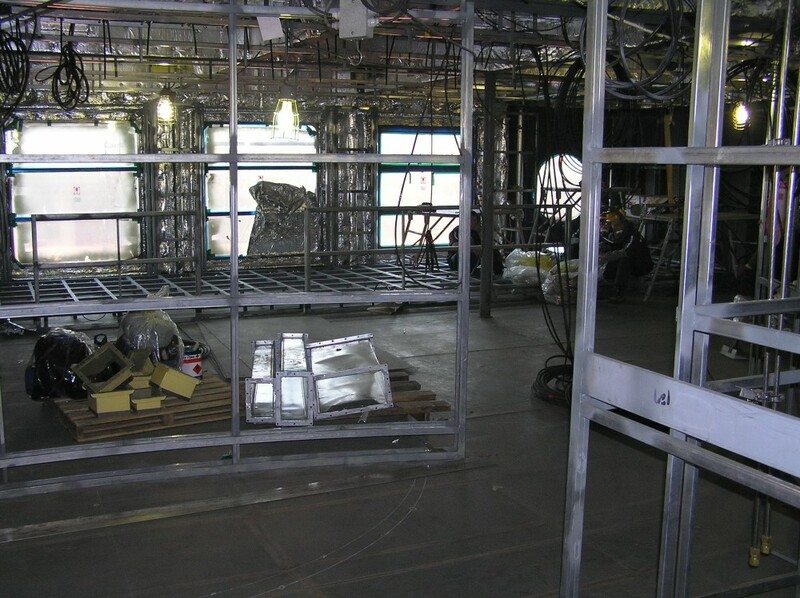 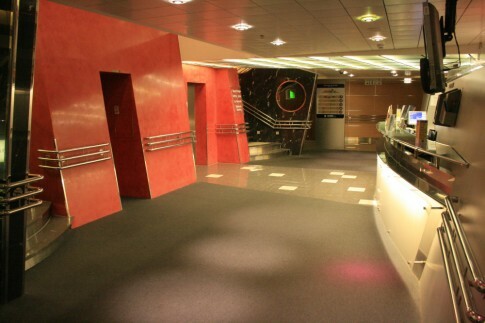 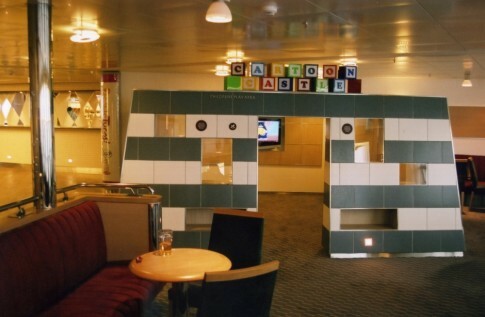 Aft of The Lounge was The Portal video games area, equipped with Sony Play Stations (seen under construction in March 2005). 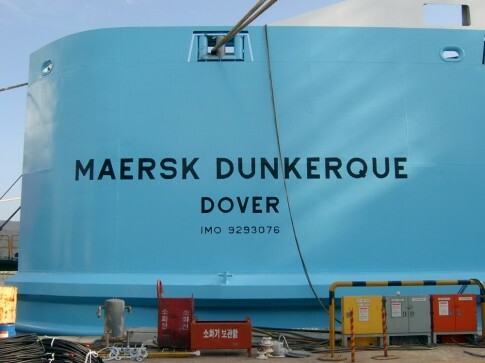 As completed on the Maersk Delft. 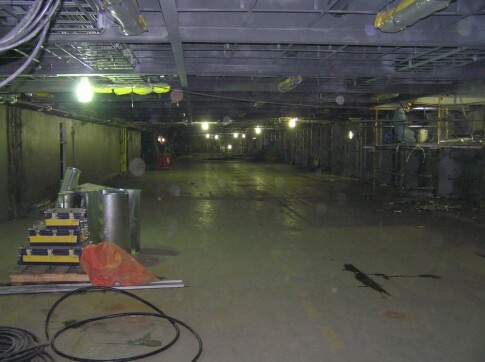 This area appears to be generally closed on the ships now. Right aft on Deck 6 is the covered outside deck. 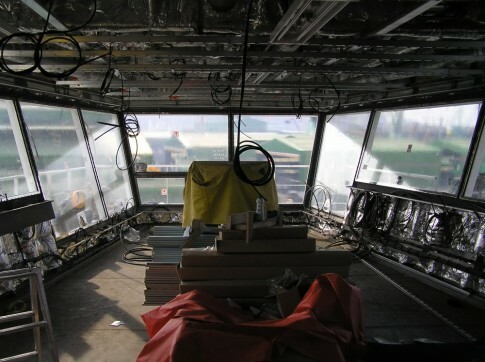 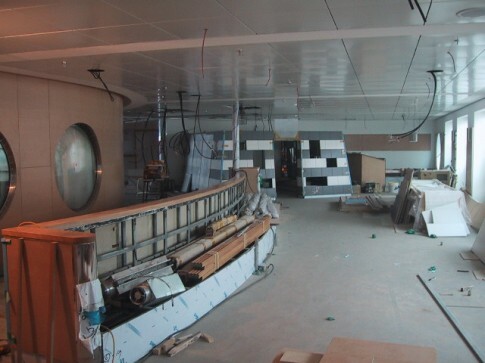 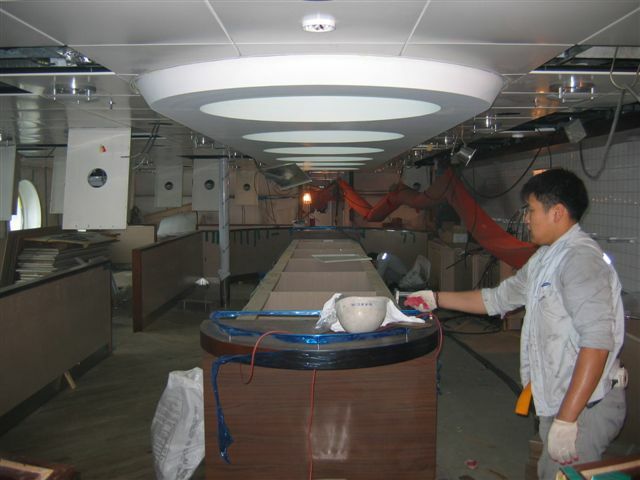 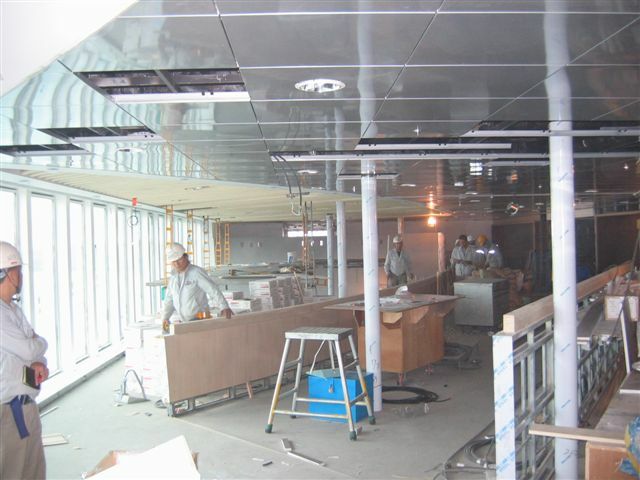 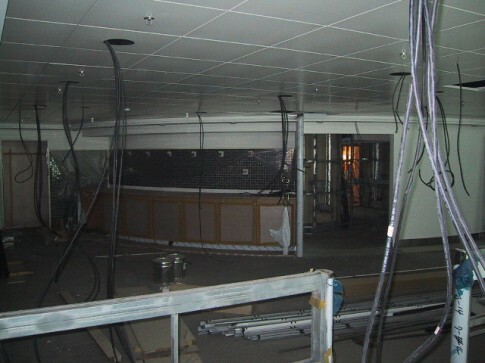 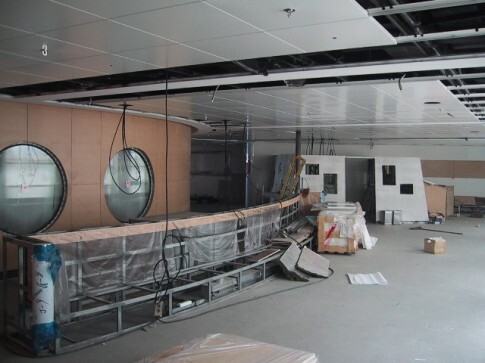 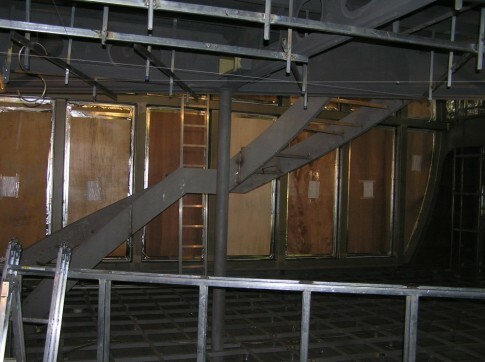 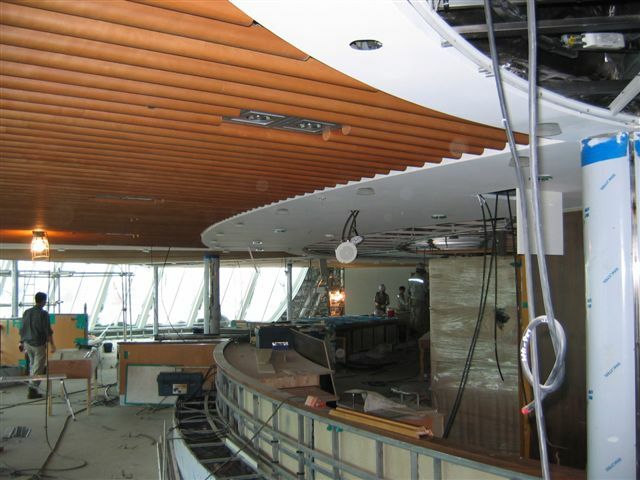 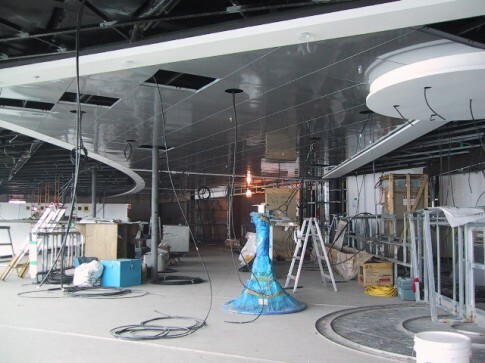 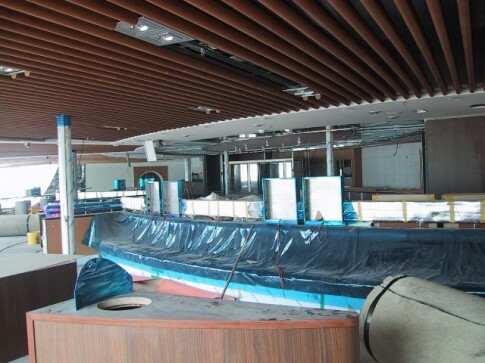 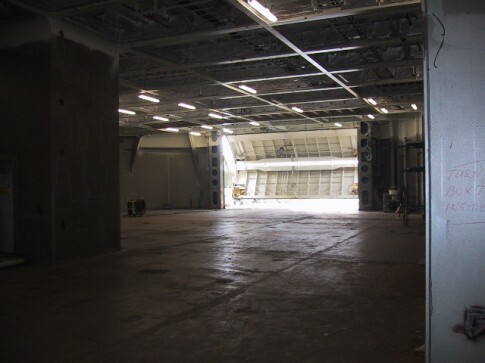 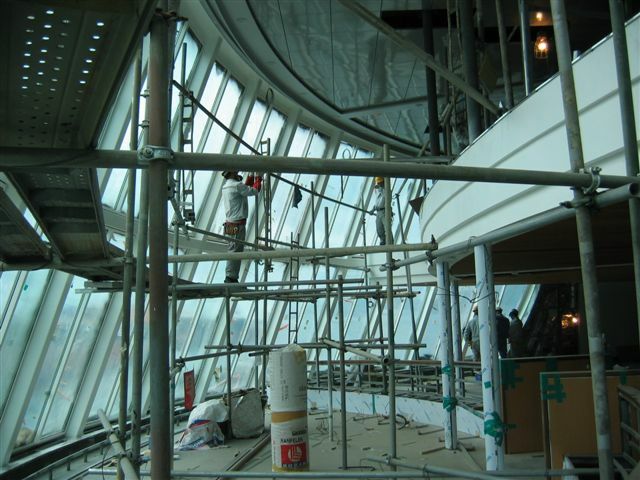 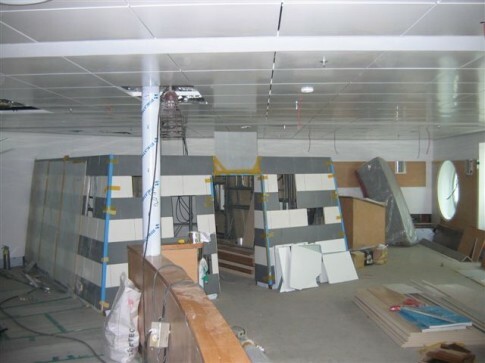 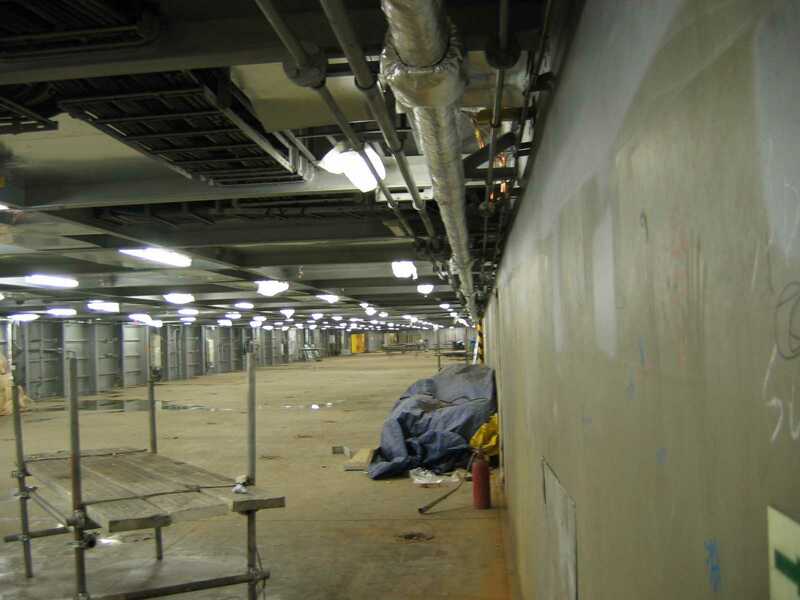 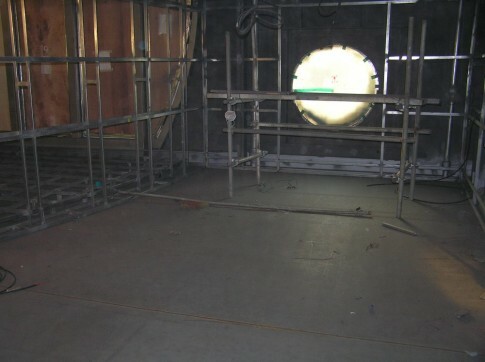 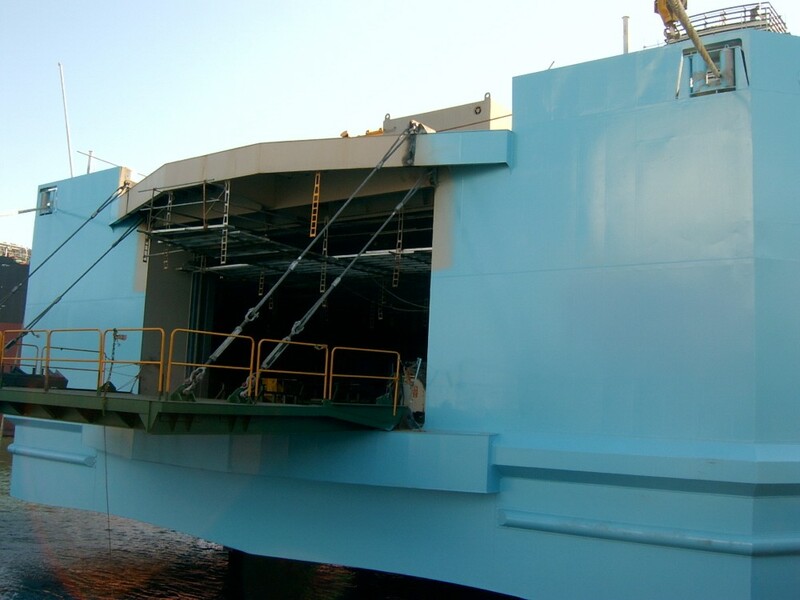 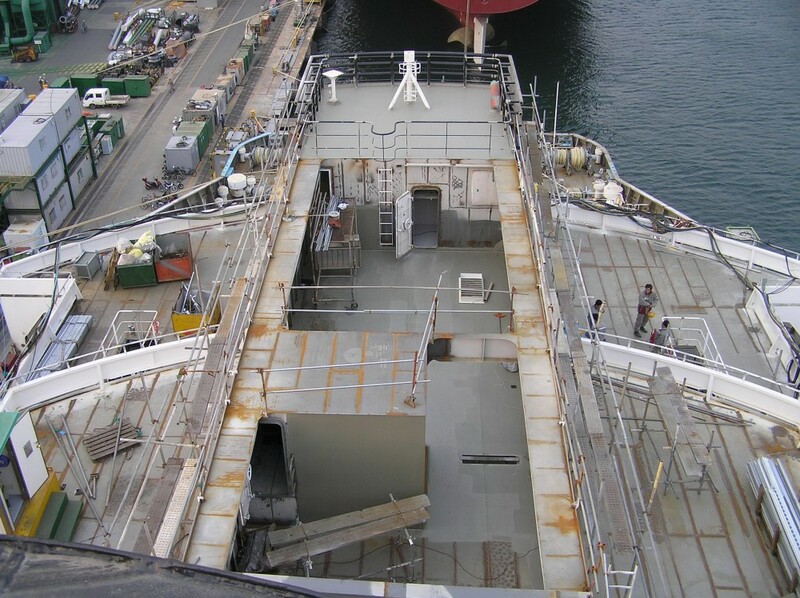 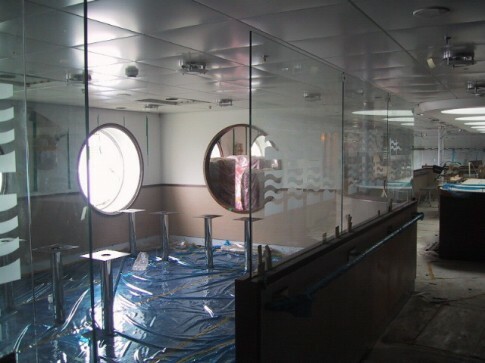 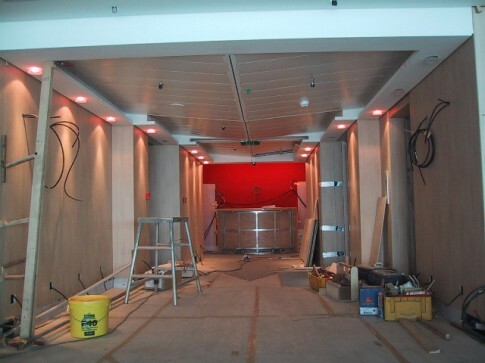 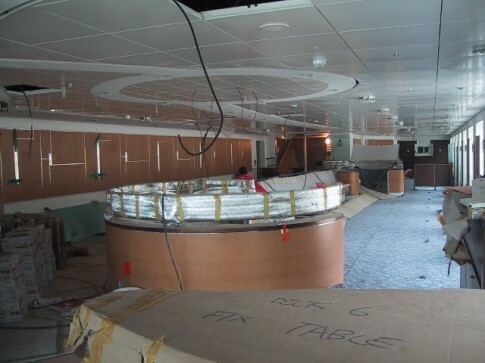 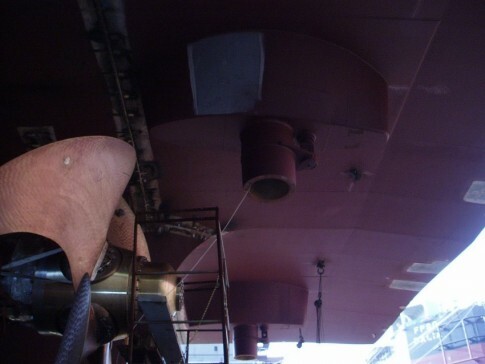 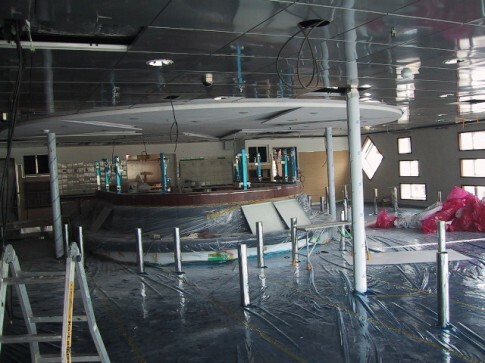 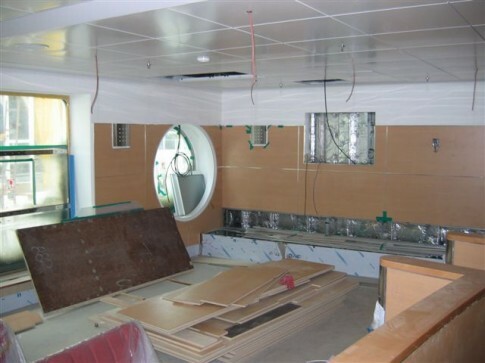 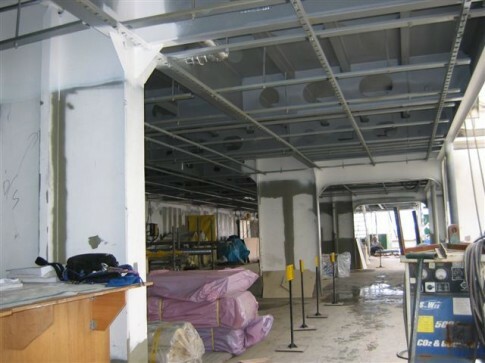 The same area, looking forward on the Maersk Delft, showing how ceiling panels were installed to enhance the area's appearance, concealing the usually ugly arrangements of piping and structural elements. The final part of this series, coming shortly, will cover the upper passenger deck and some crew areas.